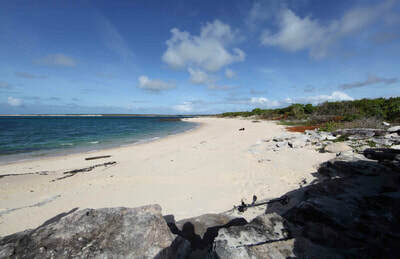 The view from Survivors Beach northwards out over Gurraka Bay - across Cumberland Strait to Marchinbar Island. PastMasters Michael Hermes - Tim Stone & Mike Owen made a preliminary site visit to establish whether archaeological remains persist at the site of Beattie's shipyard on Empire Bay where the Pat Cam was laid down. 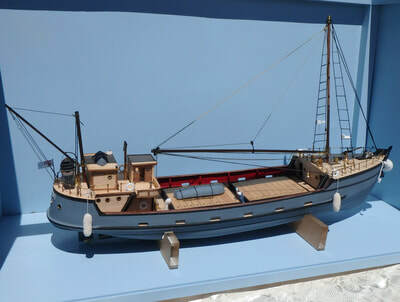 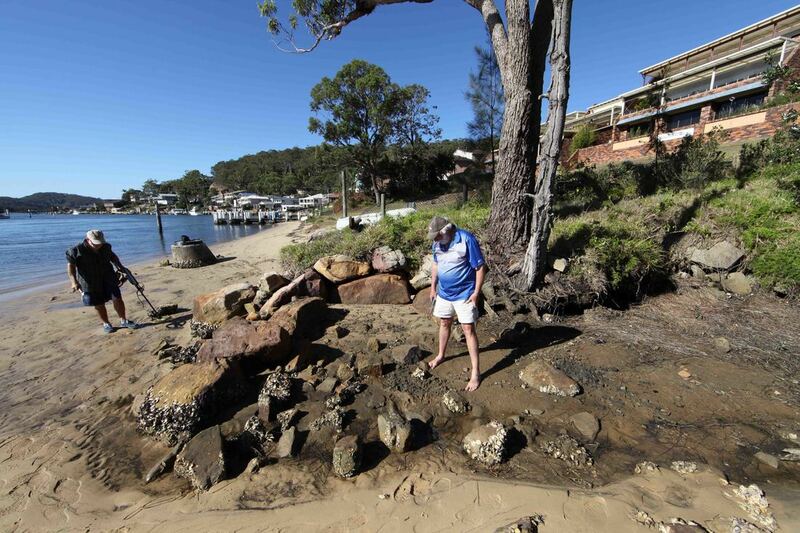 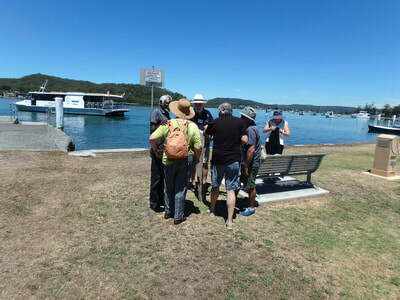 Local historian, Gwen Dundon, suspects that shipbuilding was being undertaken here during the 19th century as the steep profile, sheltered water and abundant forest provide ideal conditions. 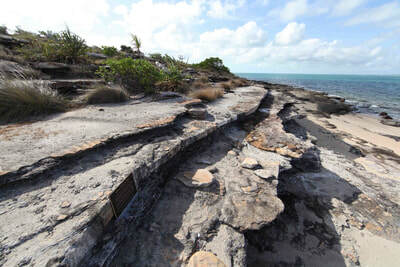 This is the only shipbuilding site on Brisbane Water that has not been built over in recent years and so offers a unique opportunity to reveal a vanished industry that was critical to the founding of the Australian nation and defence against Japan during WWII. 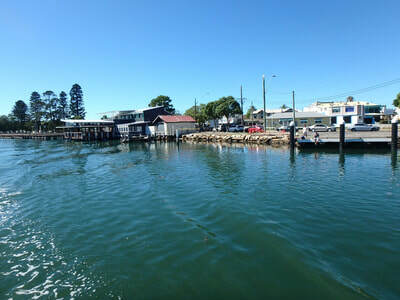 Low tide at the mouth of Cockle Creek looking North to the shipyard area. 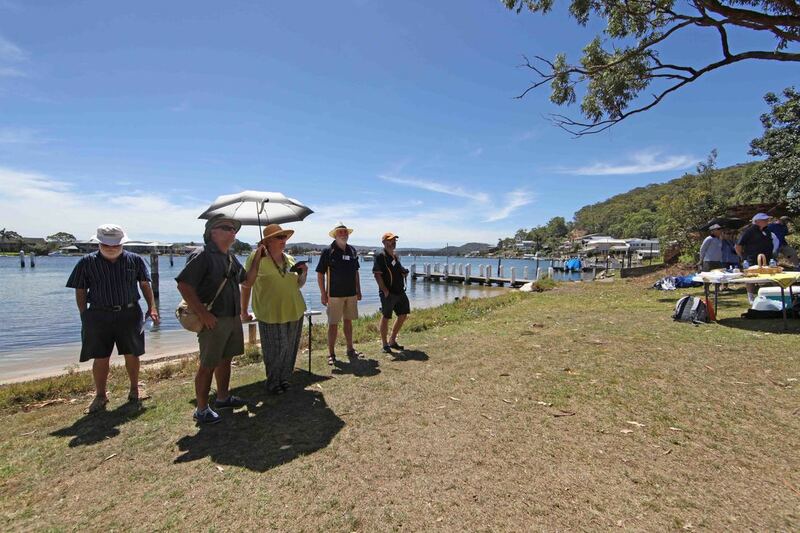 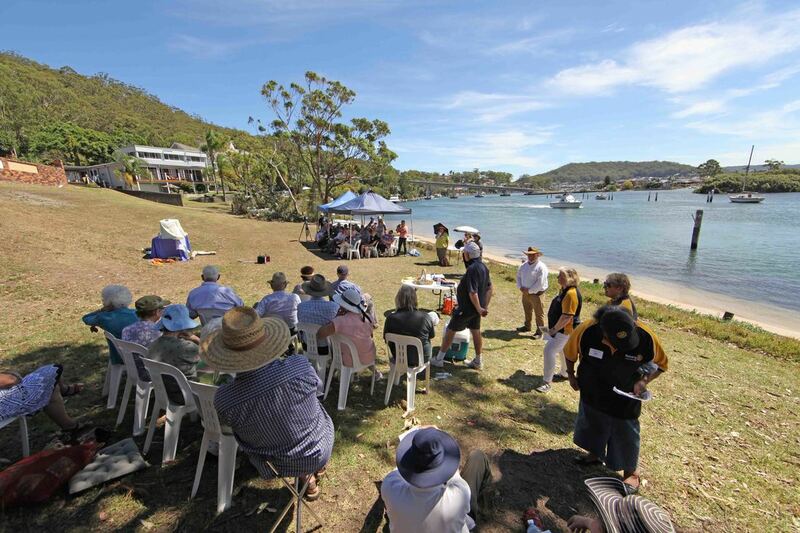 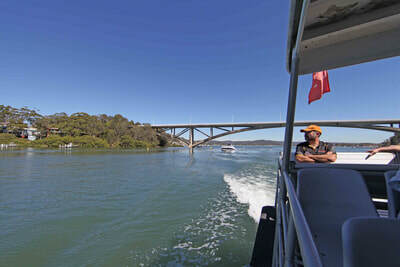 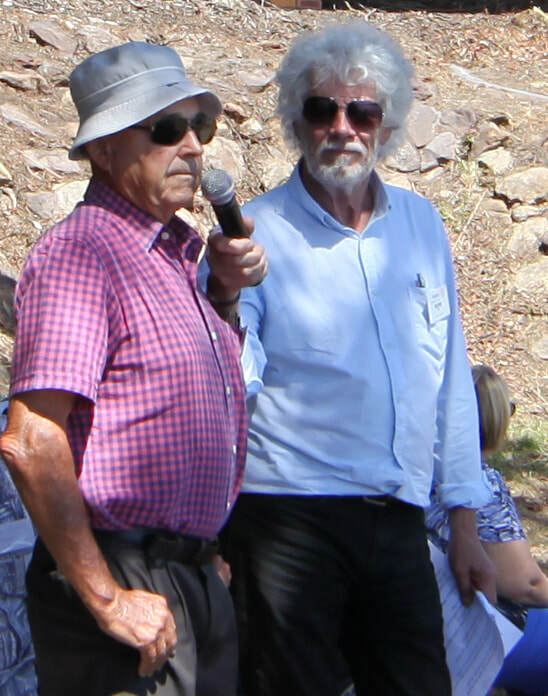 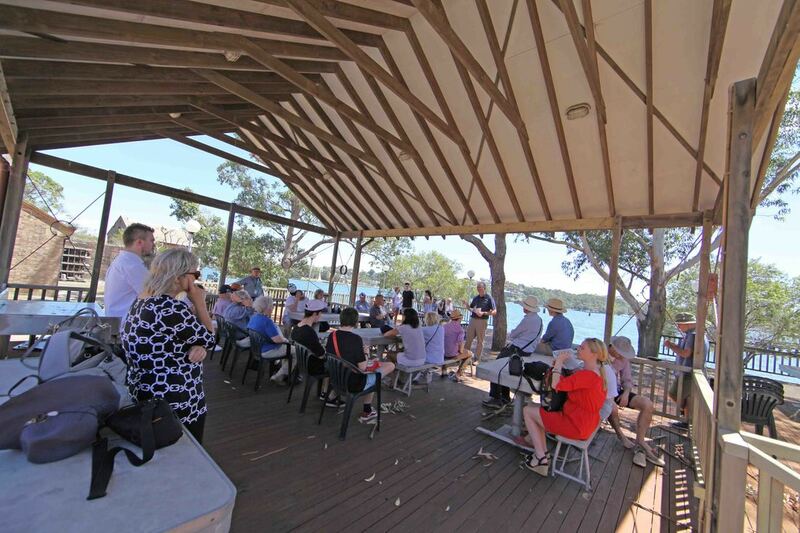 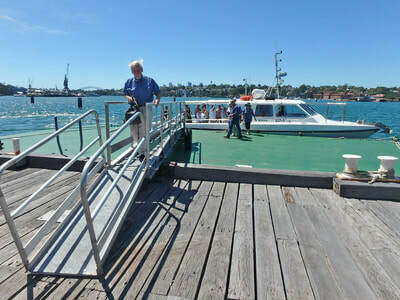 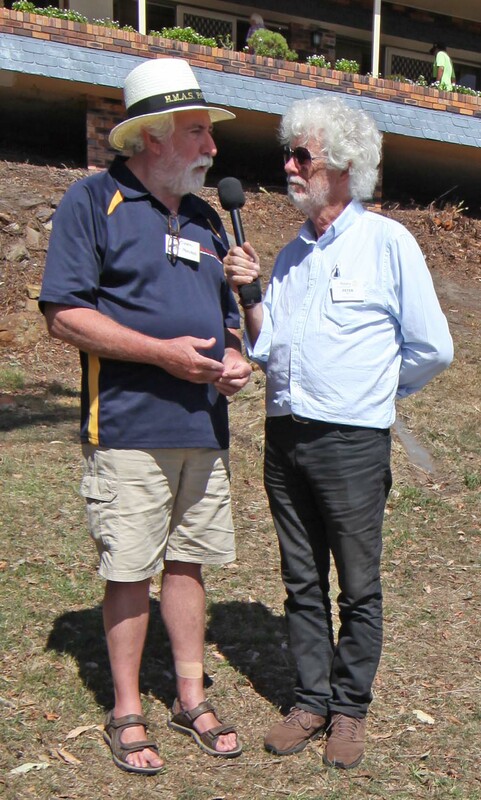 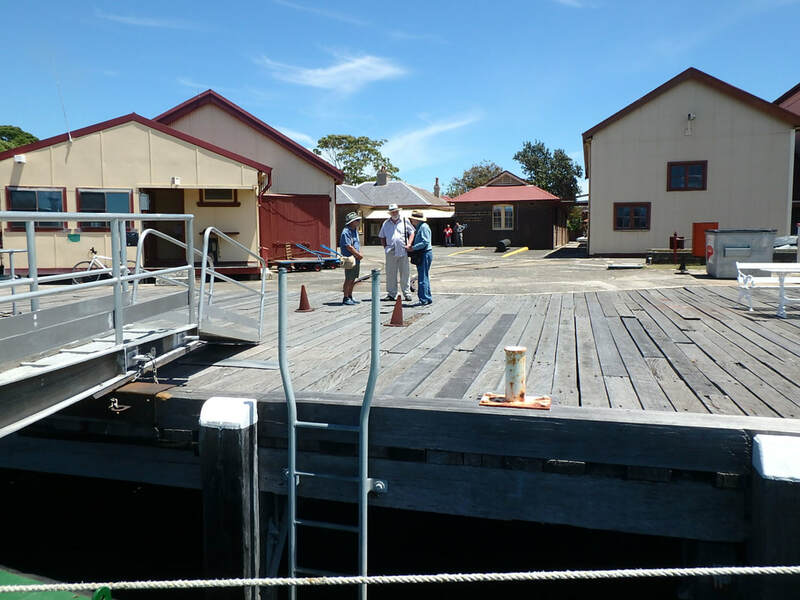 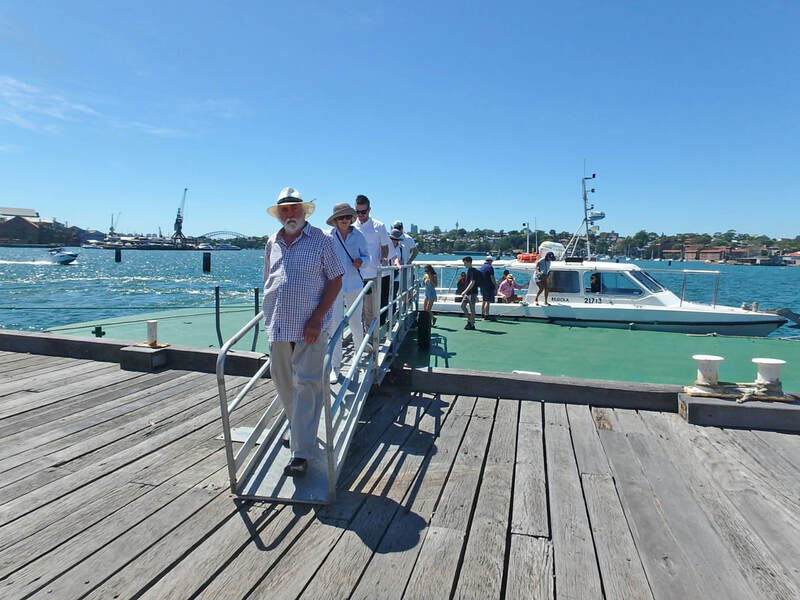 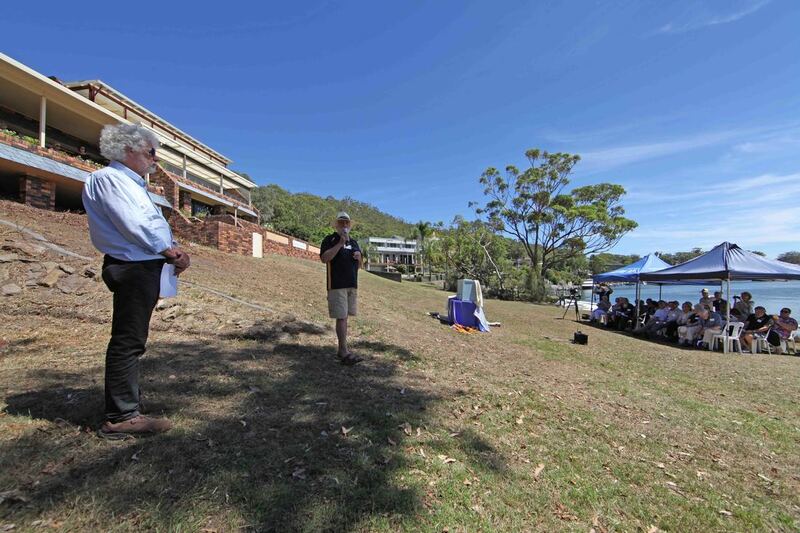 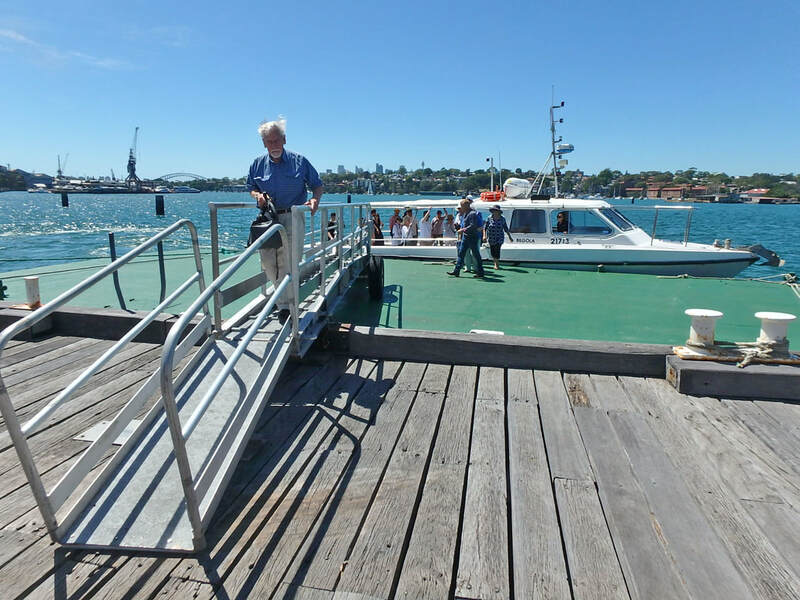 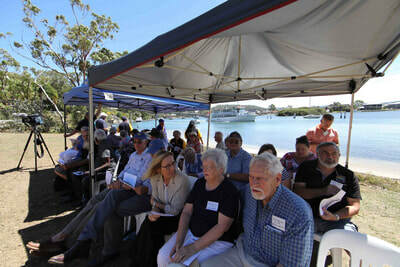 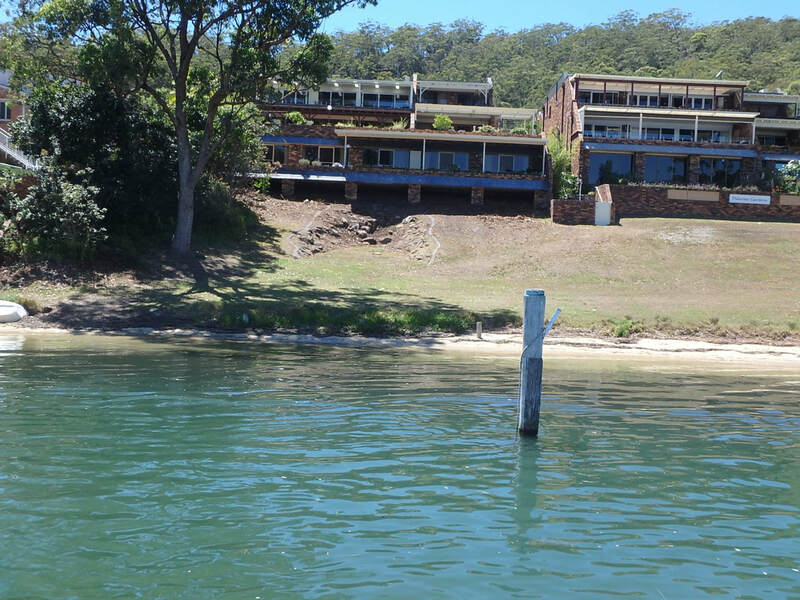 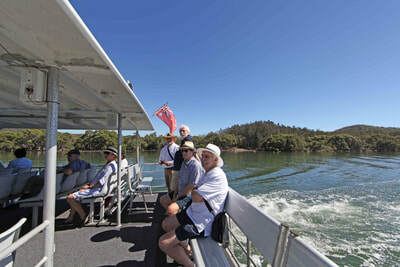 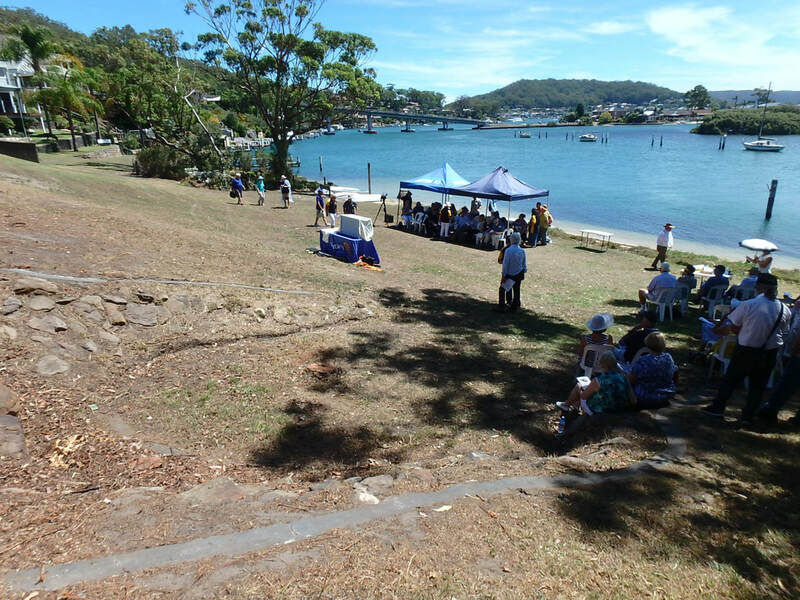 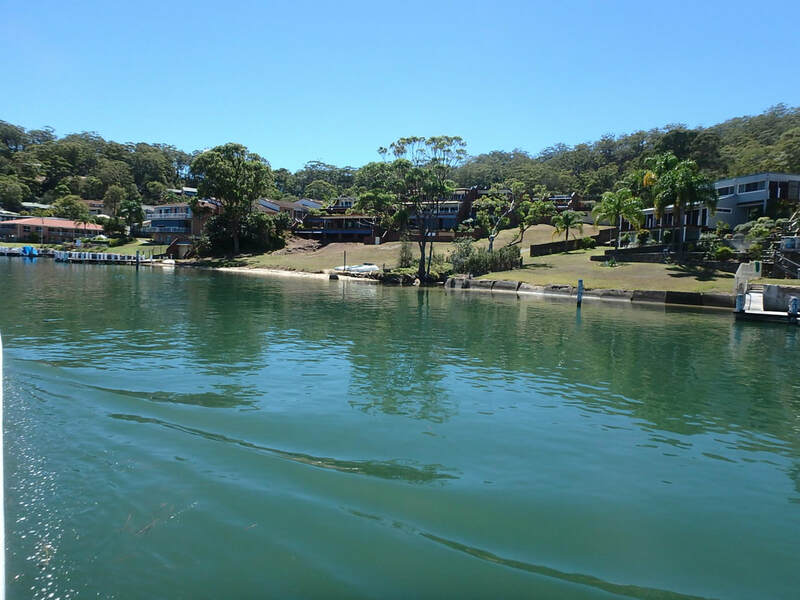 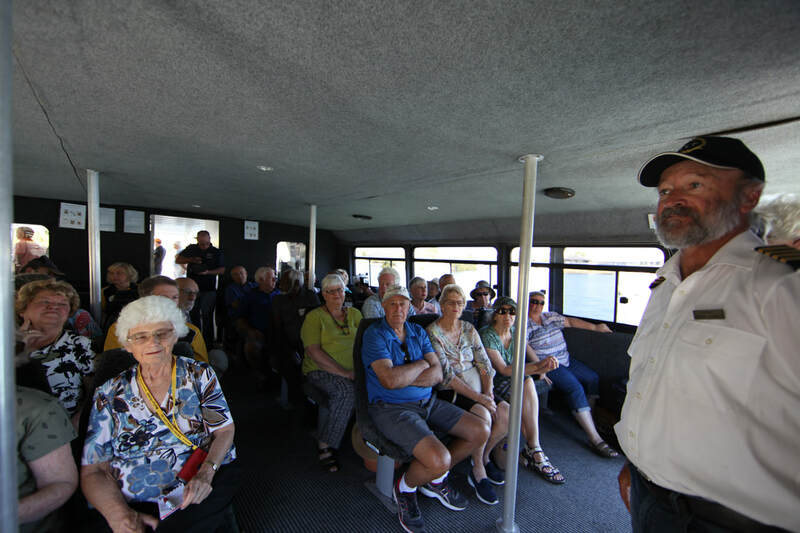 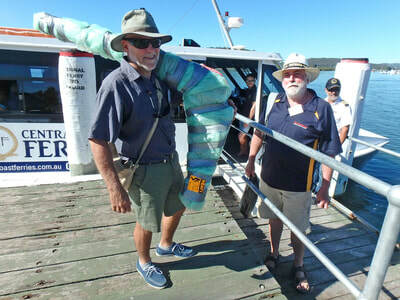 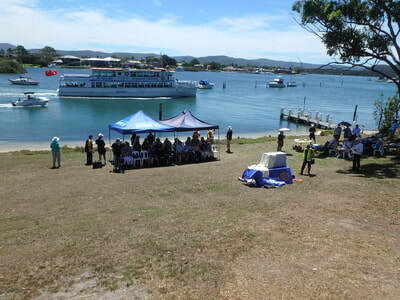 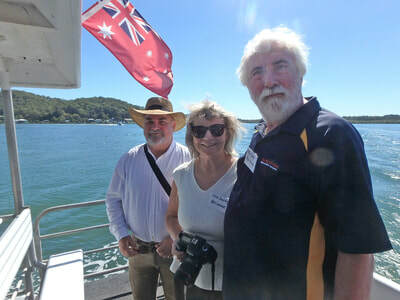 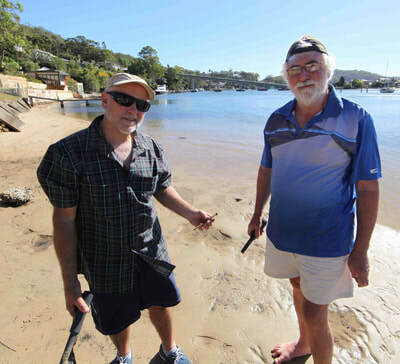 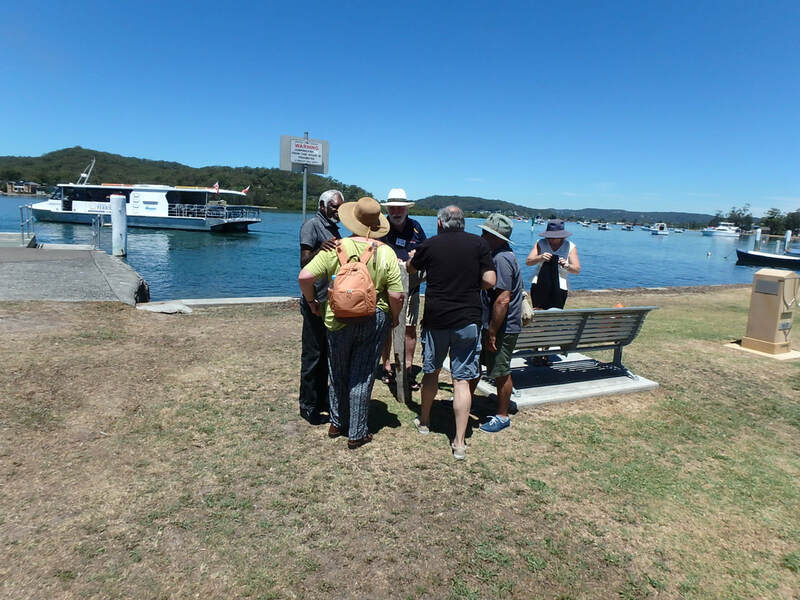 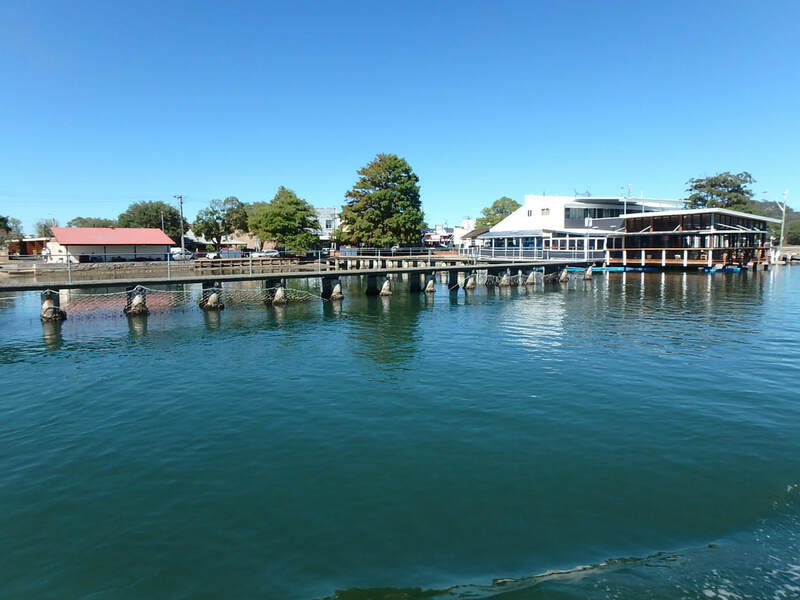 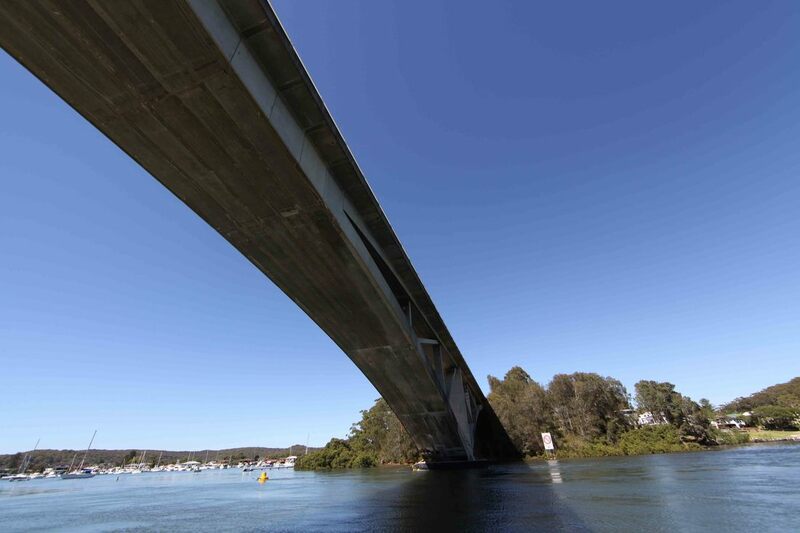 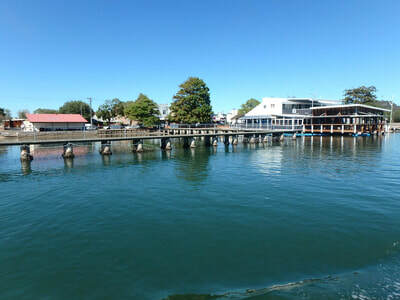 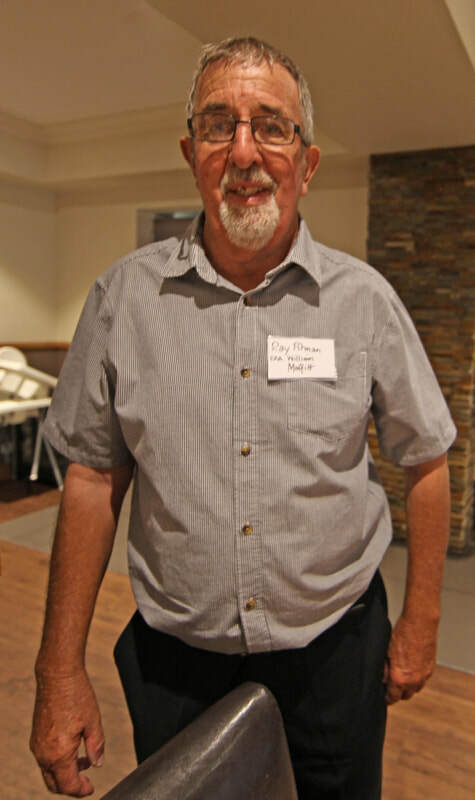 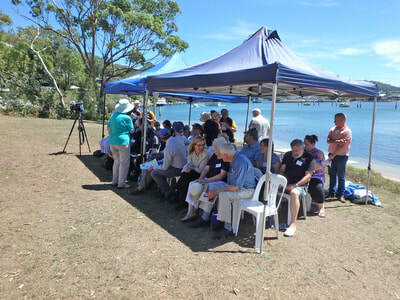 Peter Rae is vice-president of the Brisbane Water Historical Society & with assistance from the Rotary Club of Kincumber he organised a special History Ferry Tour which departed from Central Wharf, Davistown on the site where the keel for Pat Cam was sided out. 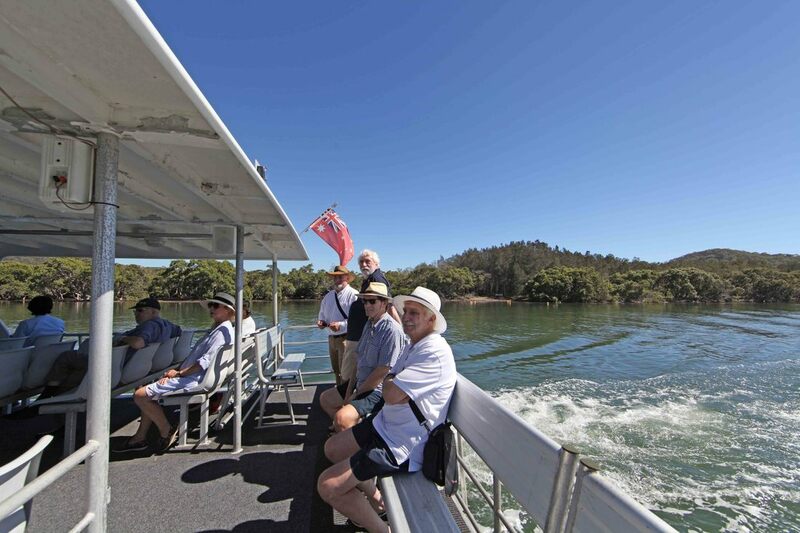 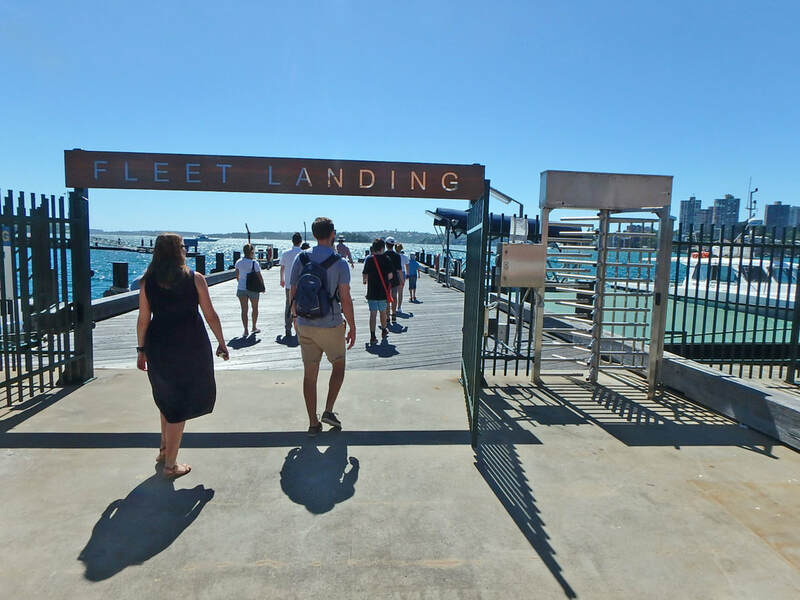 ​The ferry is equipped with a large A/V monitor to display a graphic presentation along with live commentary provided by Peter with assistance from Gwen Dundon OAM author of 'The Shipbuilders of Brisbane Water'. 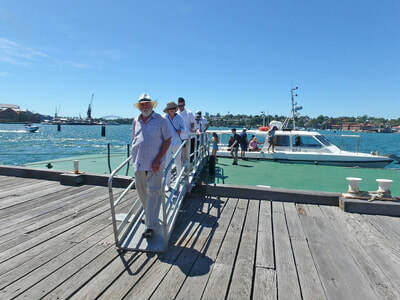 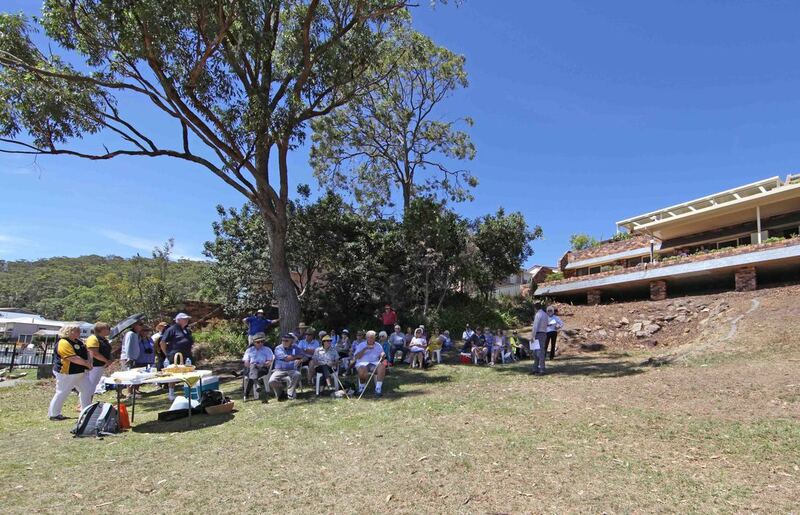 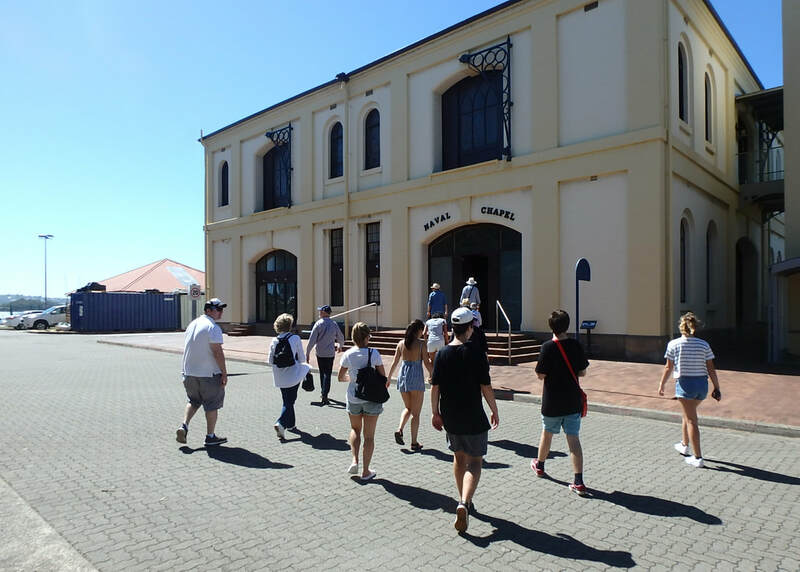 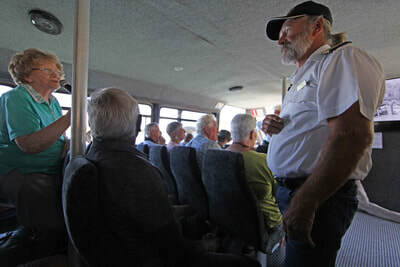 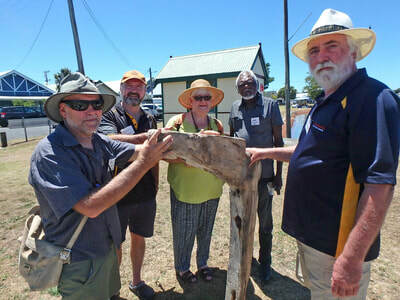 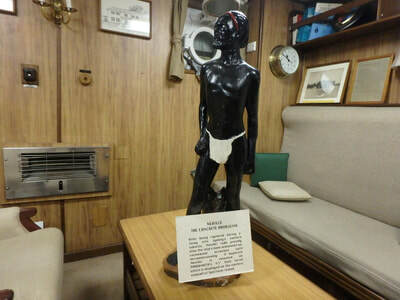 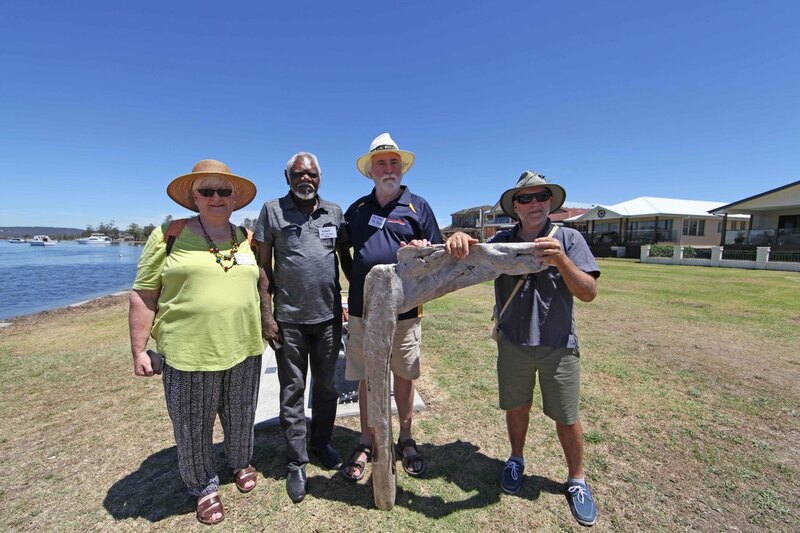 The tour concluded at 11.30am at the historic Beattie's shipyard at Palermo Park before returning to Davistown with all proceeds going towards a HMAS Patricia Cam memorial and interpretive signage. 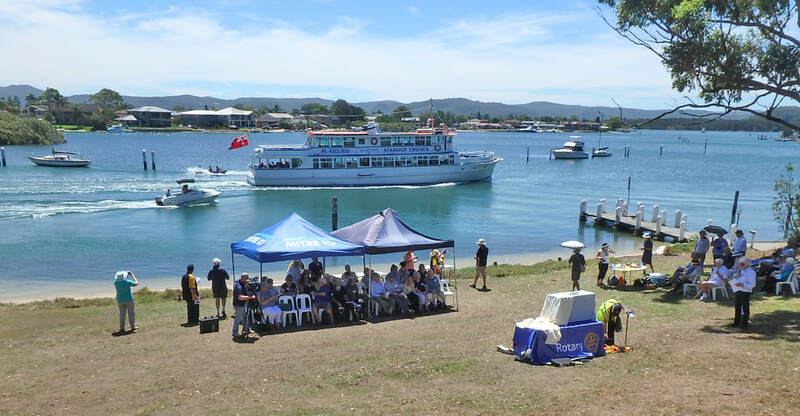 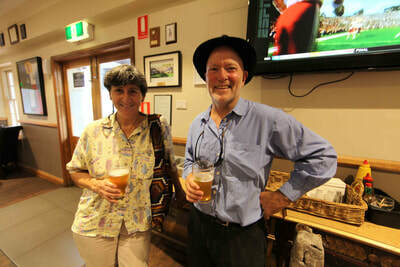 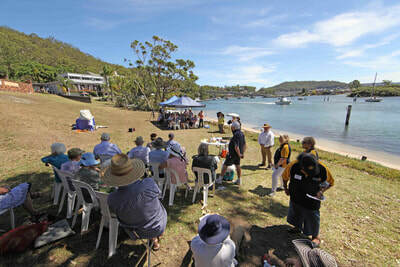 Special thanks to Central Coast Ferries for their generous support. 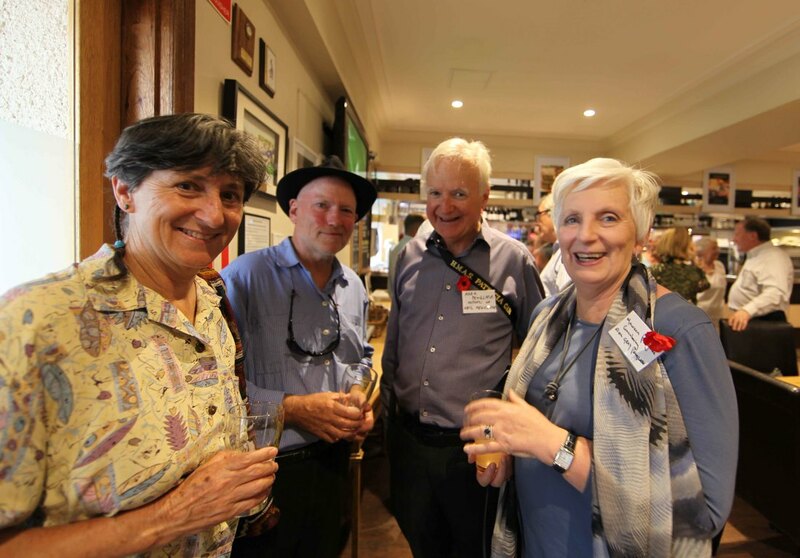 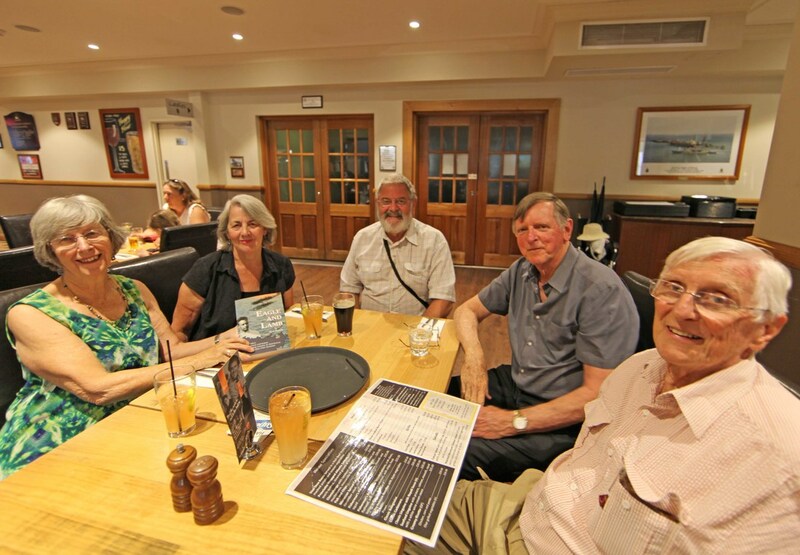 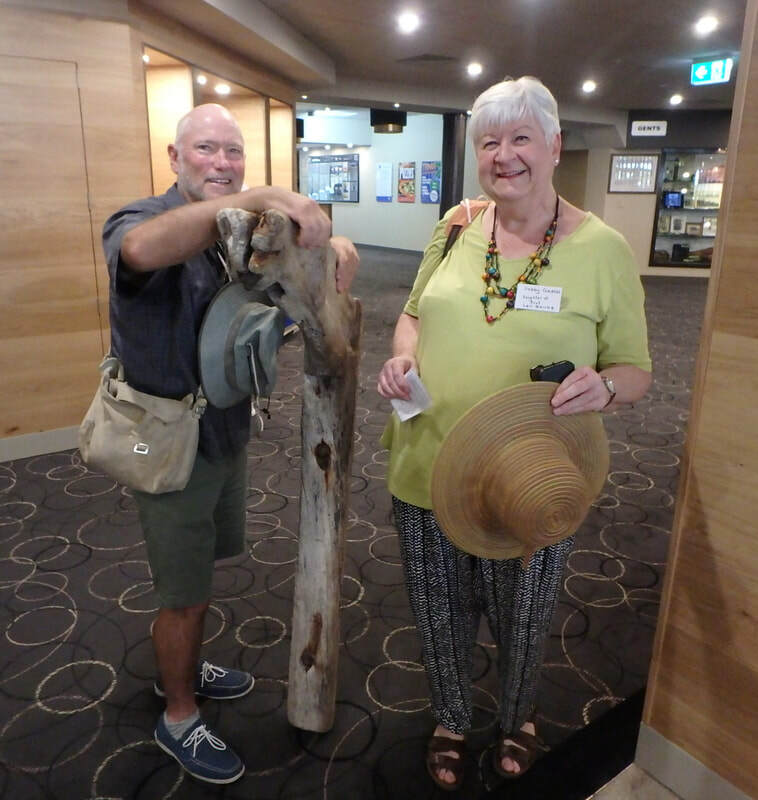 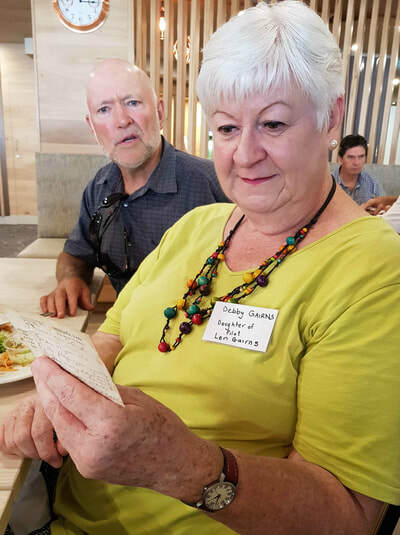 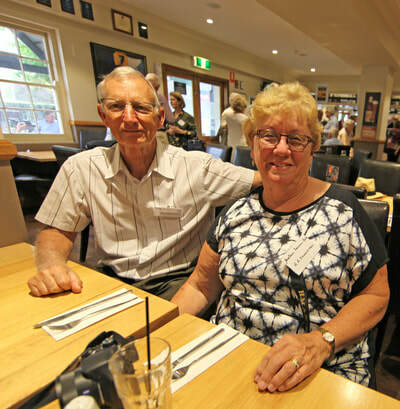 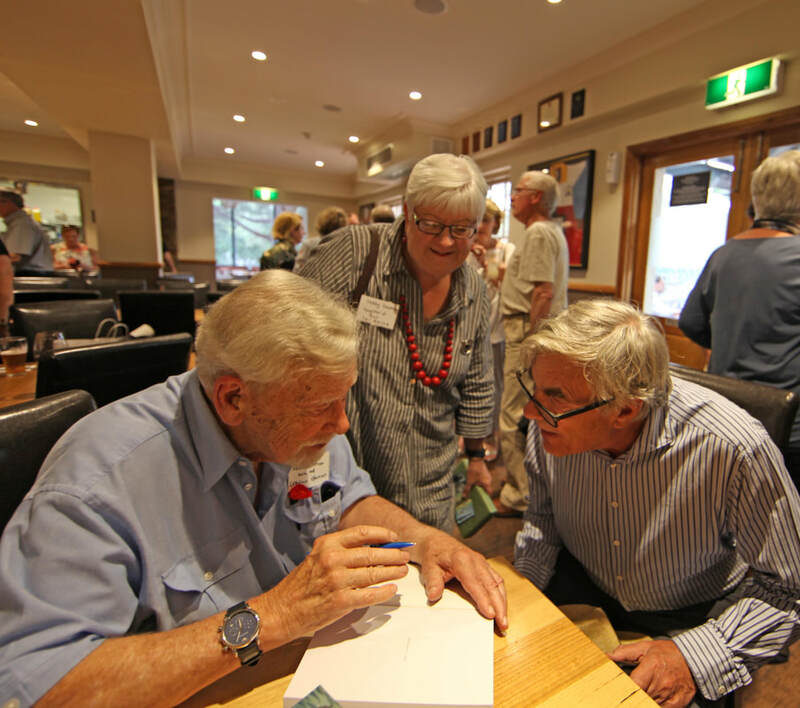 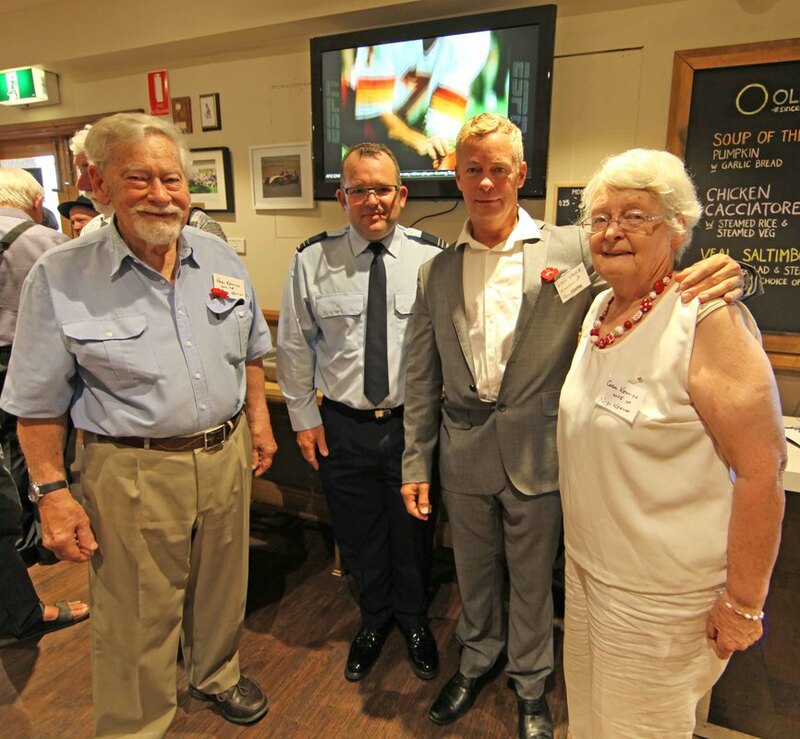 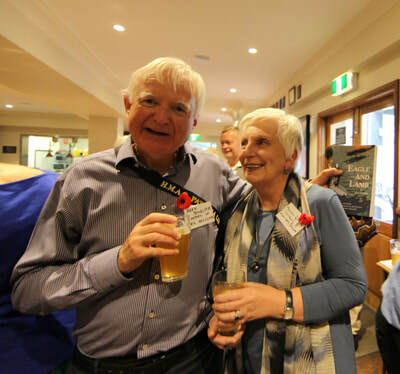 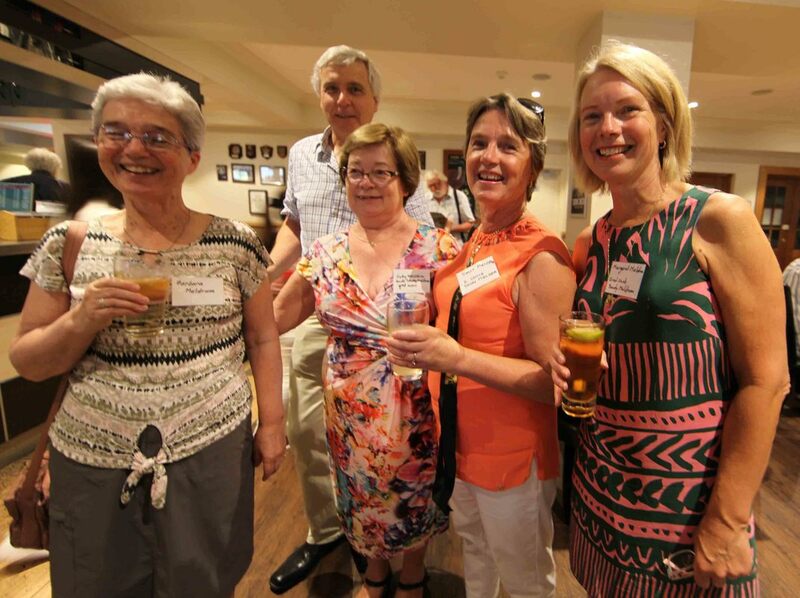 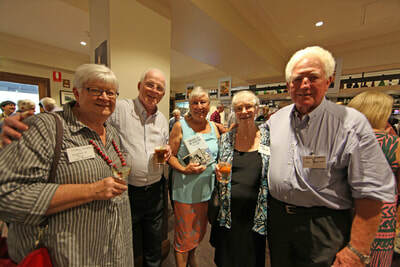 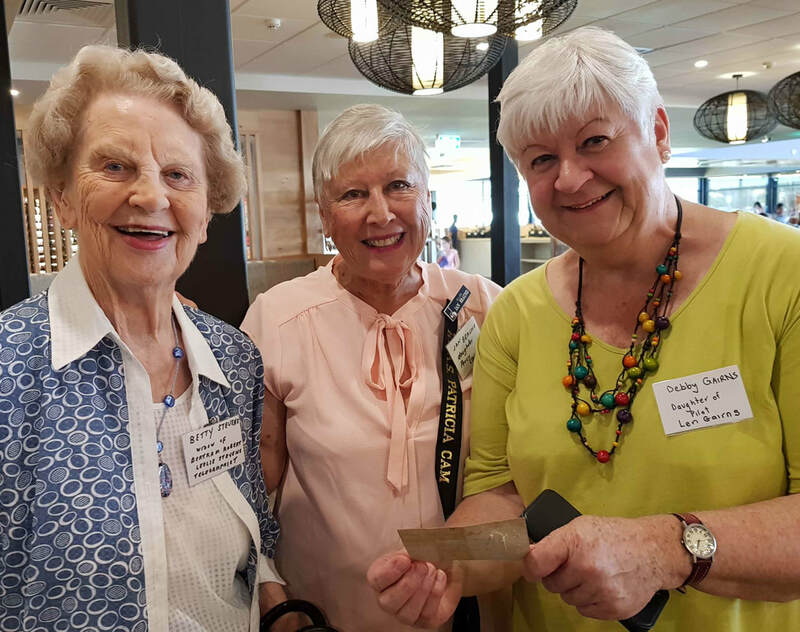 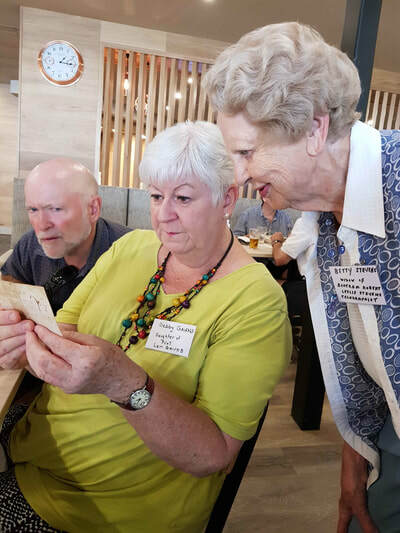 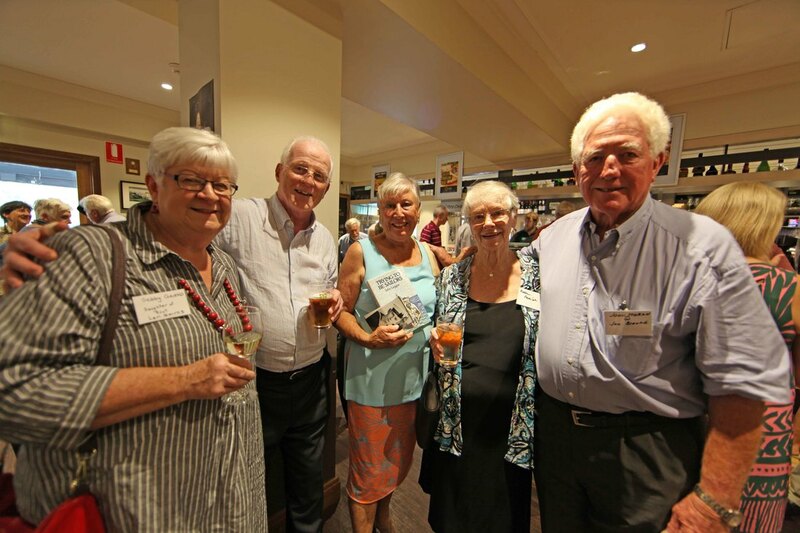 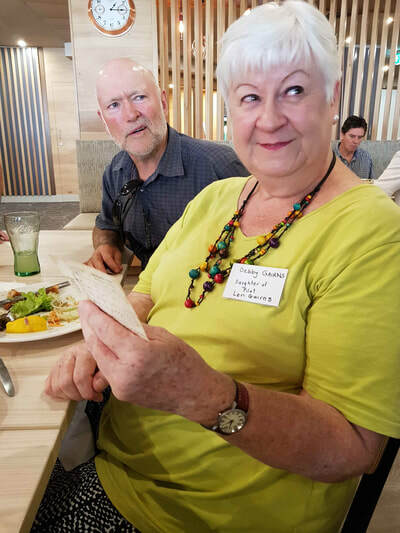 Many locals, with generational linkage to the shipbuilding industry, joined family and friends for luncheon at the Davistown RSL which was organised by Graeme Davies of Rotary International. 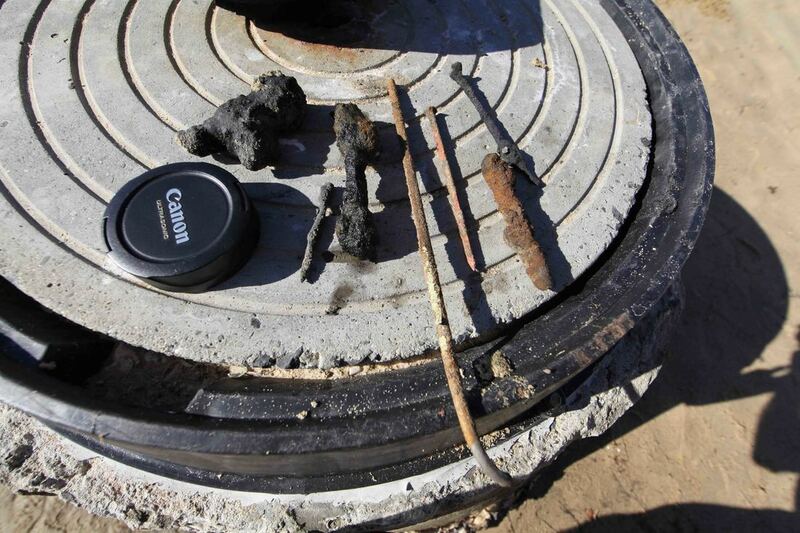 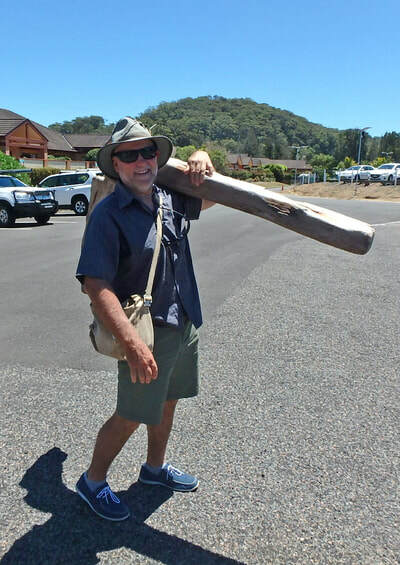 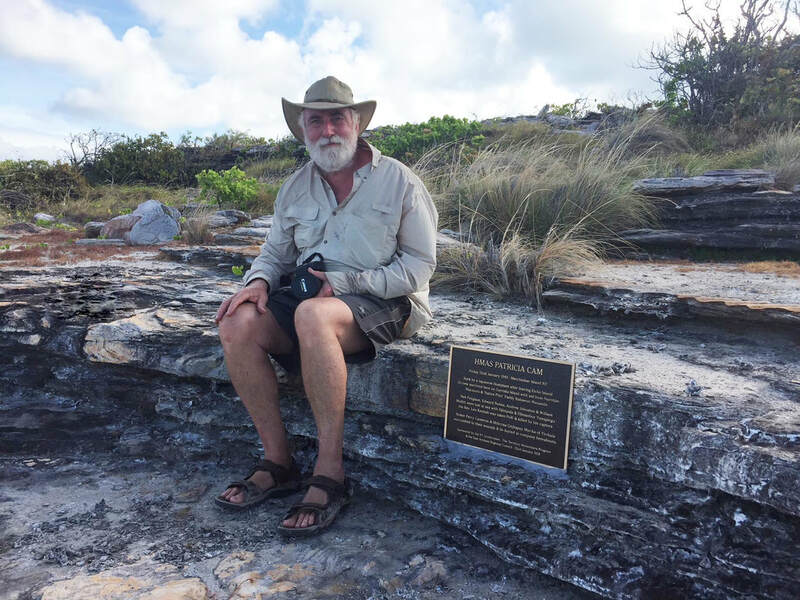 The image shows Michael Hermes, senior archaeologist with PastMasters, supporting the ship's beam knee which he found on Marchinbar Island during the 2013 Ancient Coins in Arnhem Land Expedition to the Wessel Islands. 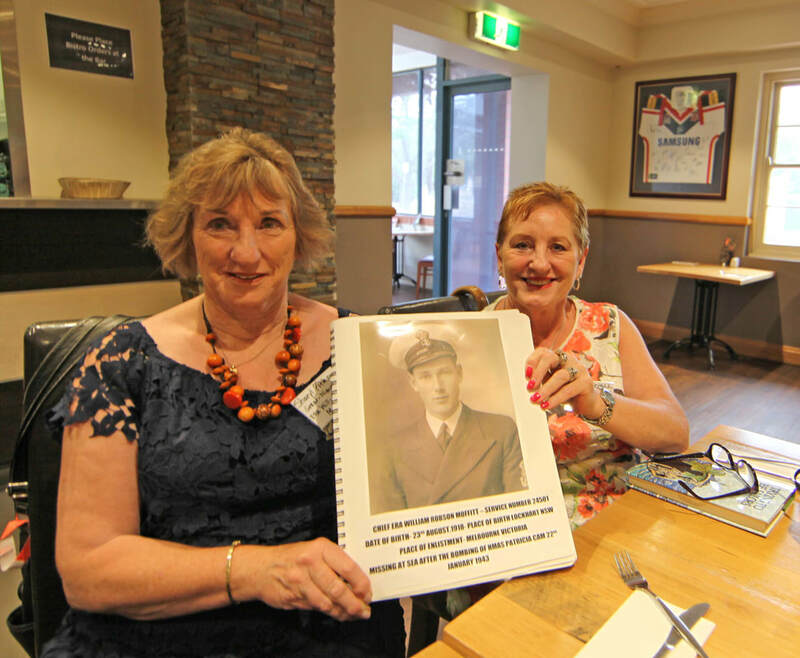 With Michael is Debby Gairns, the daughter of Beaufort pilot Len Gairns who found the survivors of the sinking of the Pat Cam. 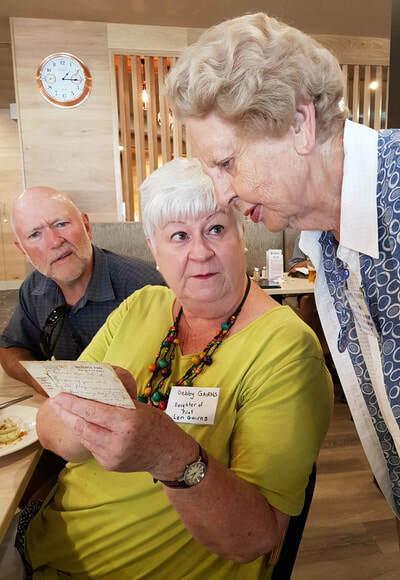 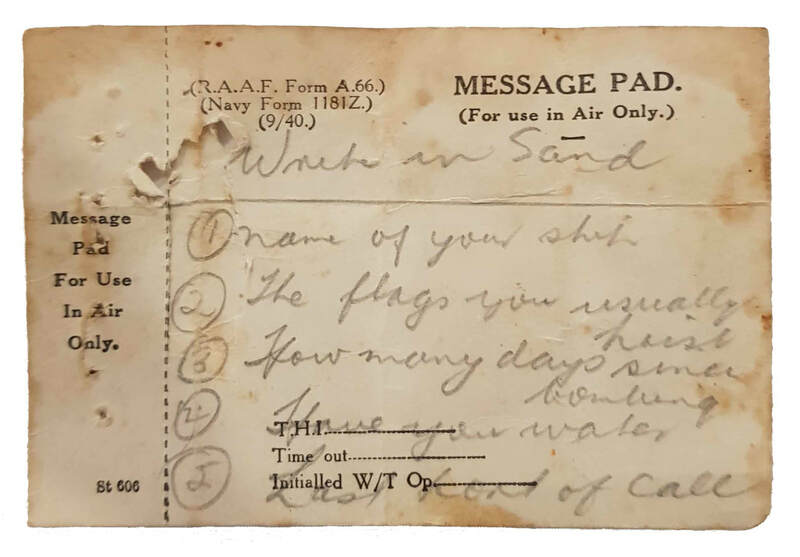 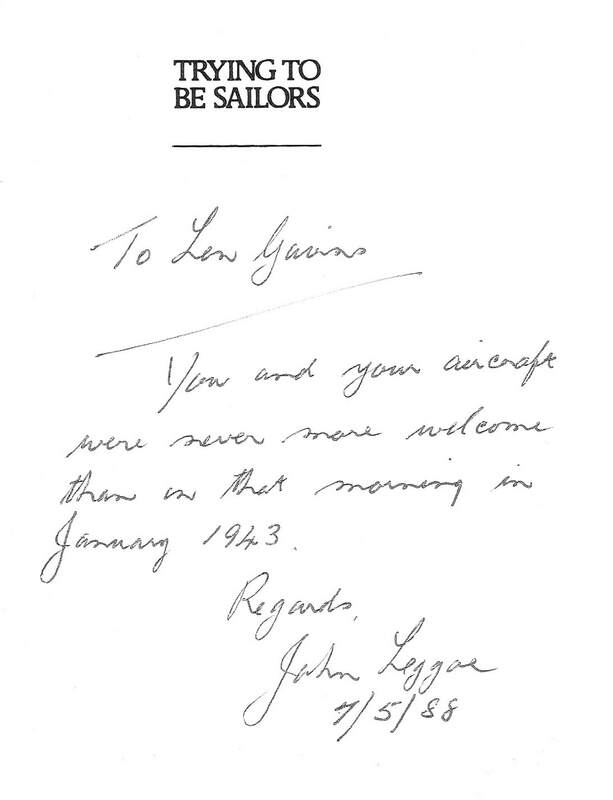 ​Debby has been working her way through her father's archive and has recently uncovered letters from the survivors expressing their gratitude for their rescue and delivery of urgently needed supplies. 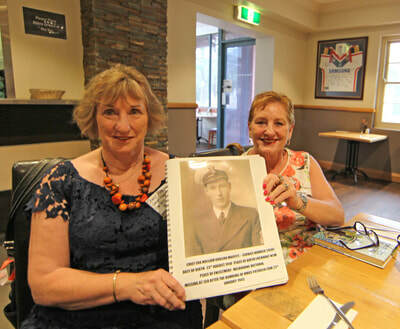 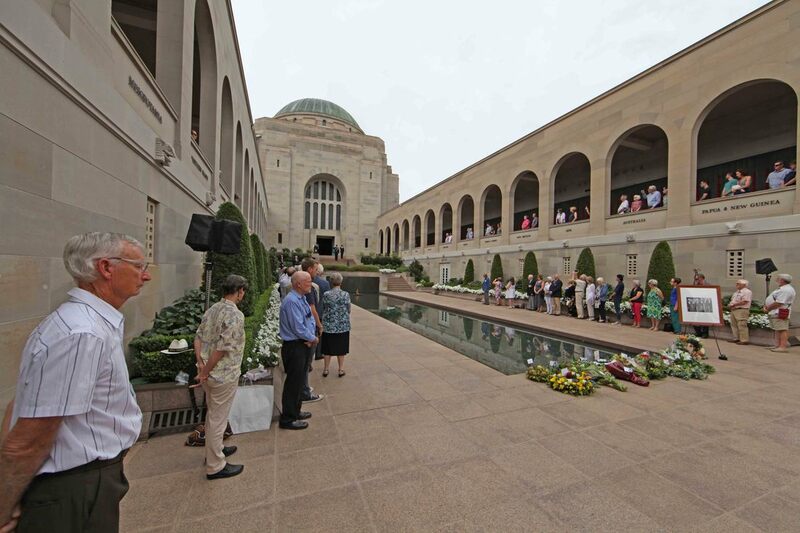 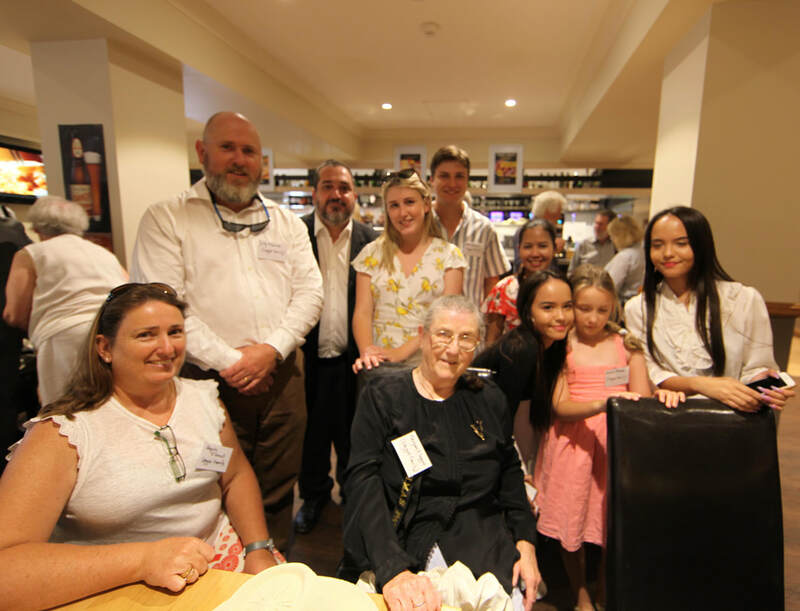 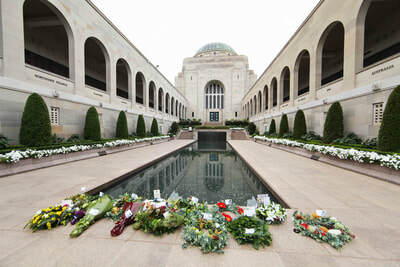 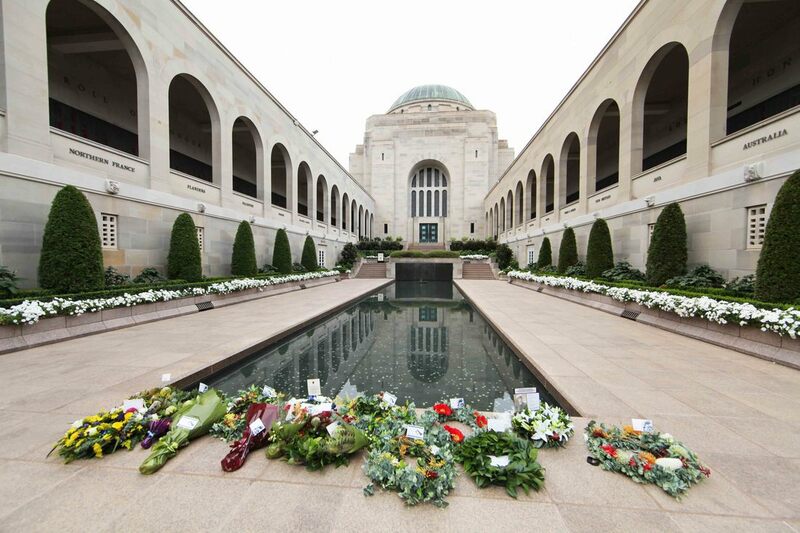 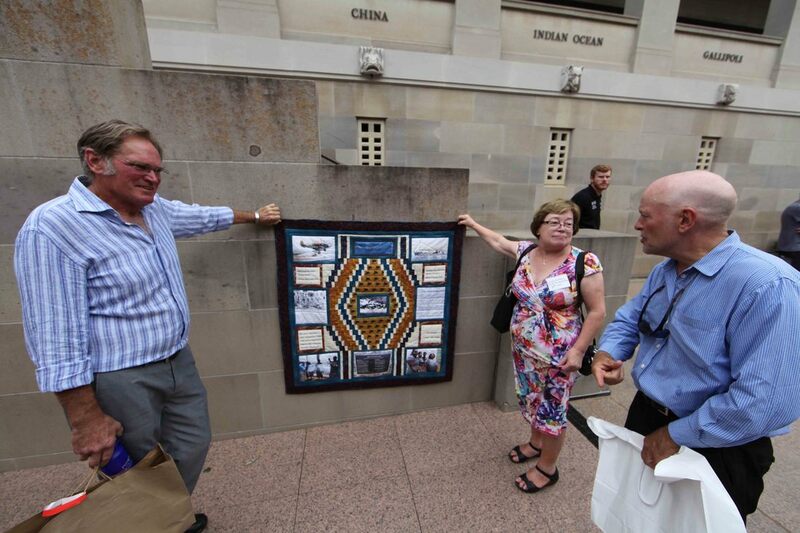 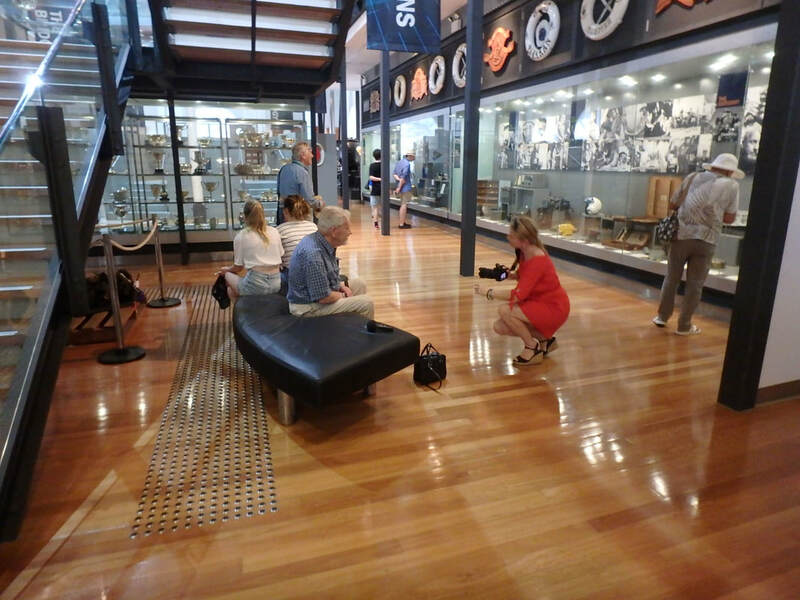 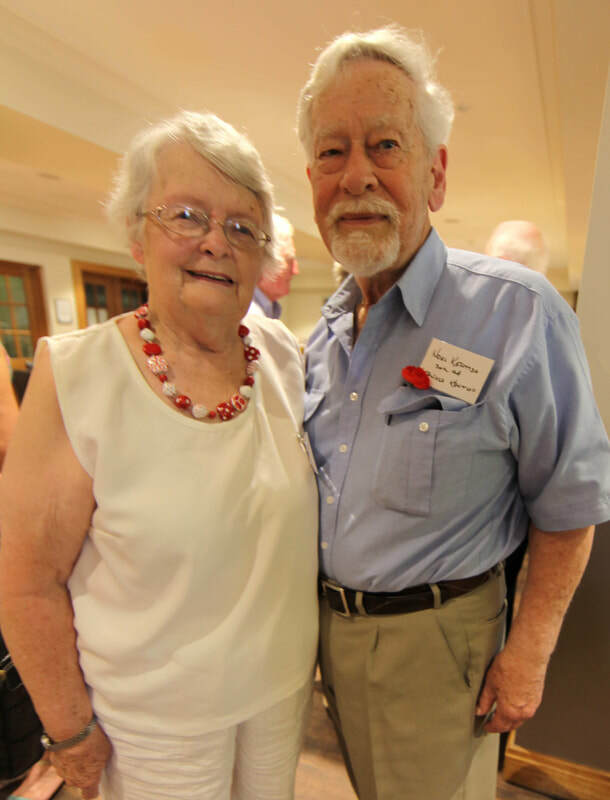 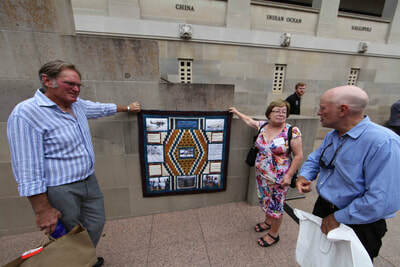 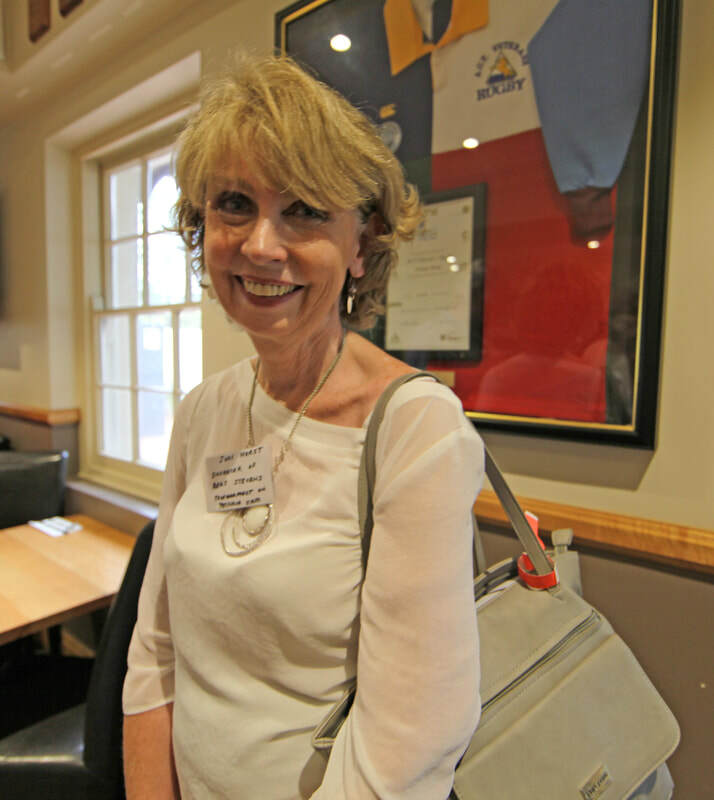 ​Betty Stevens was the last family of crew contacted and whilst unable to come to Canberra she made a very special contribution to the weekend of commemorative events. Image of answers to above questions - raft, graves above & survivors - photo by Len Gairns taken on following morning. 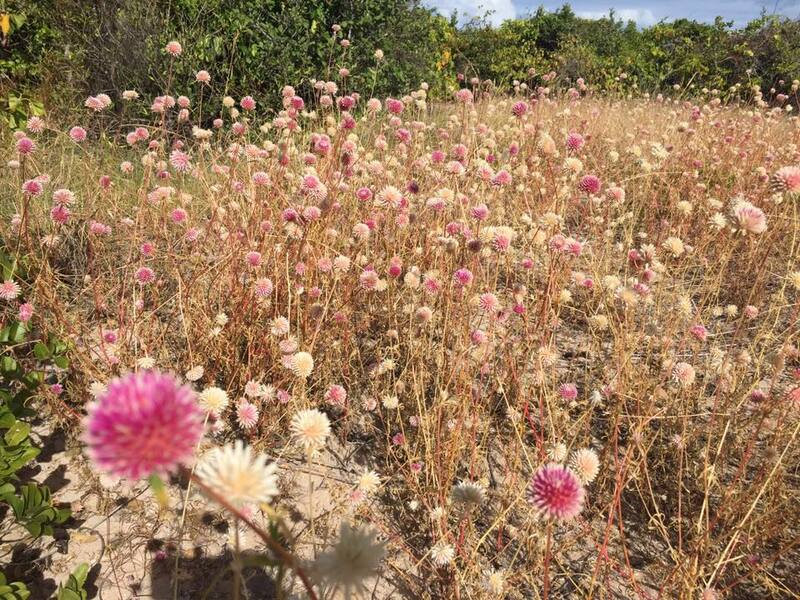 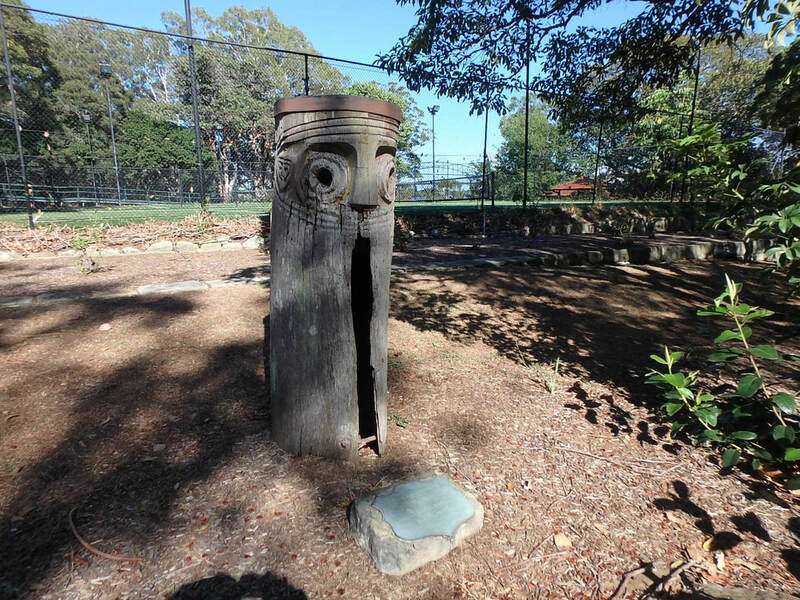 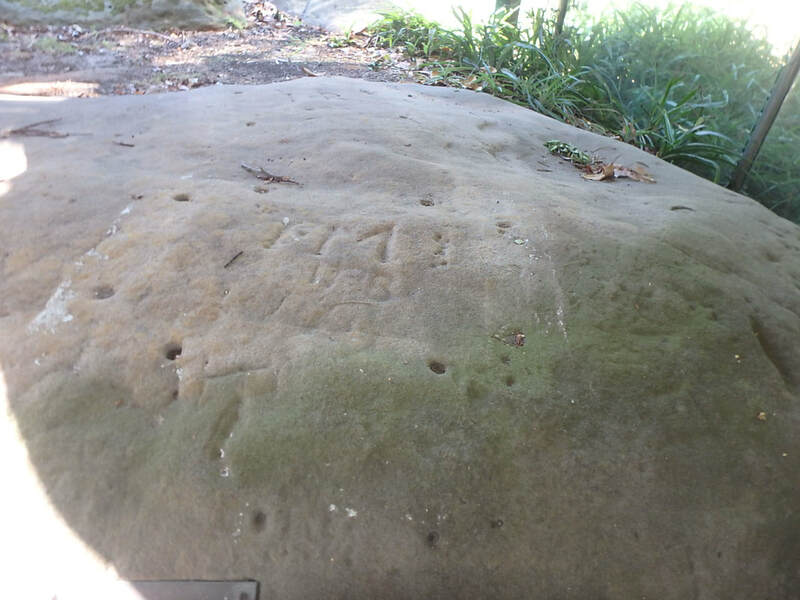 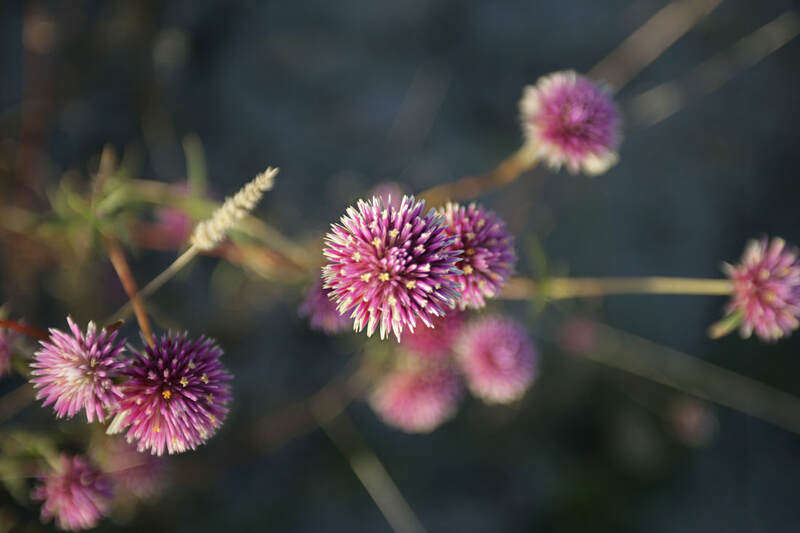 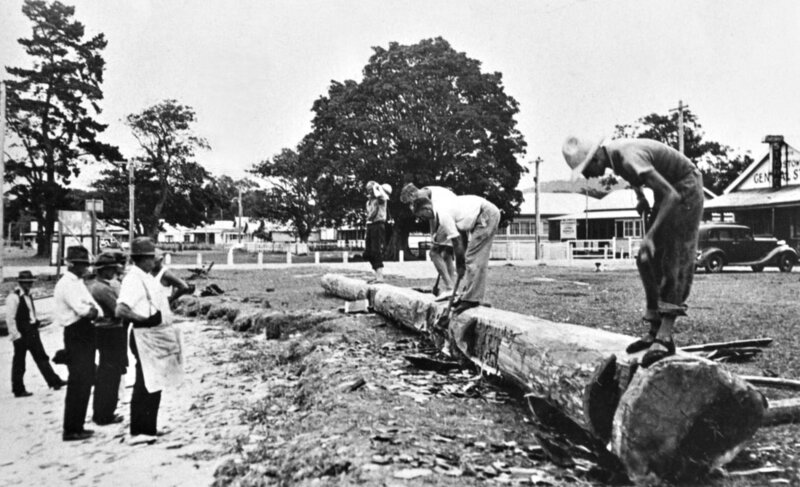 Palermo Park was recently cleared of undergrowth for the occasion - it is the only remaining site where may be found archaeological evidence of the once numerous Brisbane Water slipways. 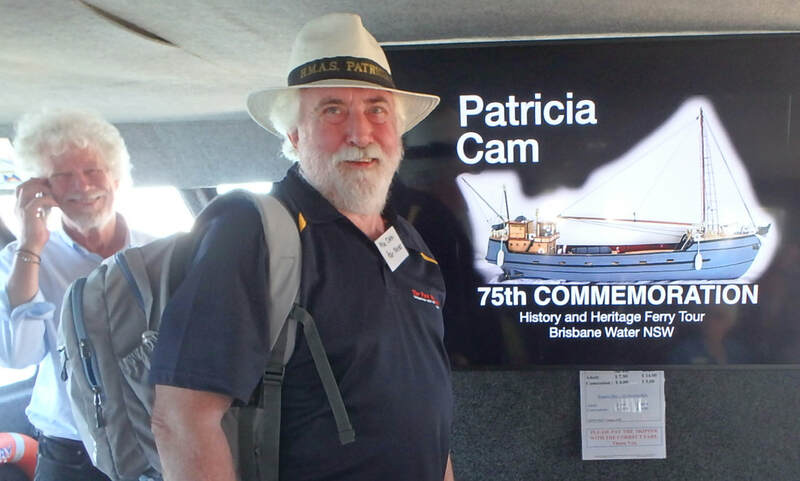 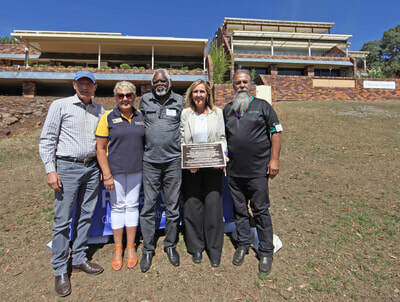 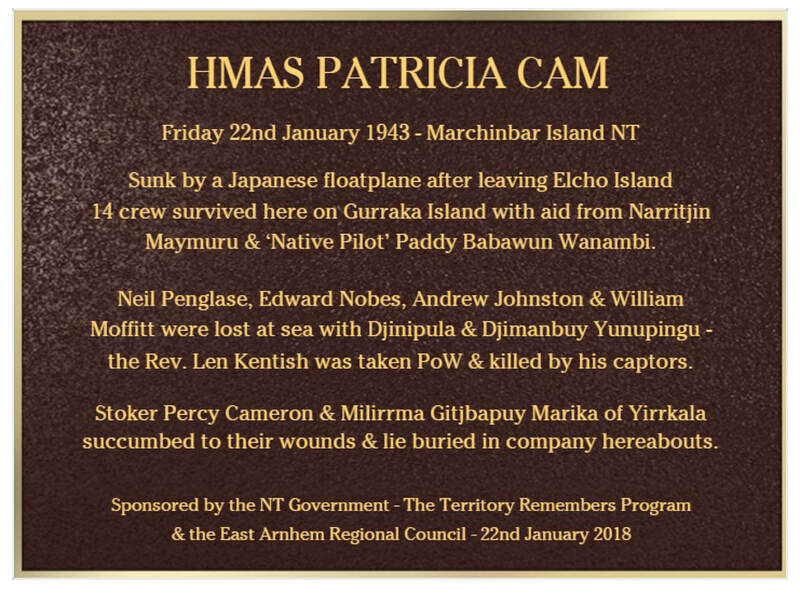 A ceremony was held to unveil the model of Pat Cam as a prelude to the unveiling of a plaque that has been specially cast with support from the N.T. 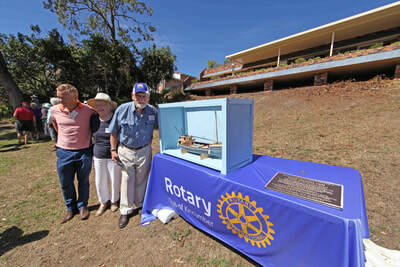 Government for installation at Palermo Park to commemorate Beattie's contribution to Brisbane Water shipbuilding history - it will become part of the Rotary Club of Kincumber’s Shipbuilders Memorial. 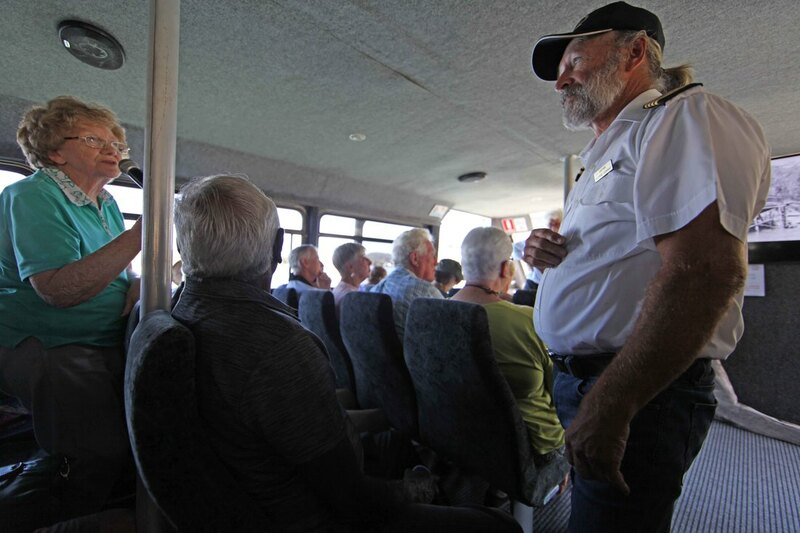 A wonderful tour of the Naval Establishments at Garden Island & Spectacle Island was organised by Walter Burroughs, editor of the Naval Historical Review & Captain David Michael RANR, President of the Naval Historical Society. 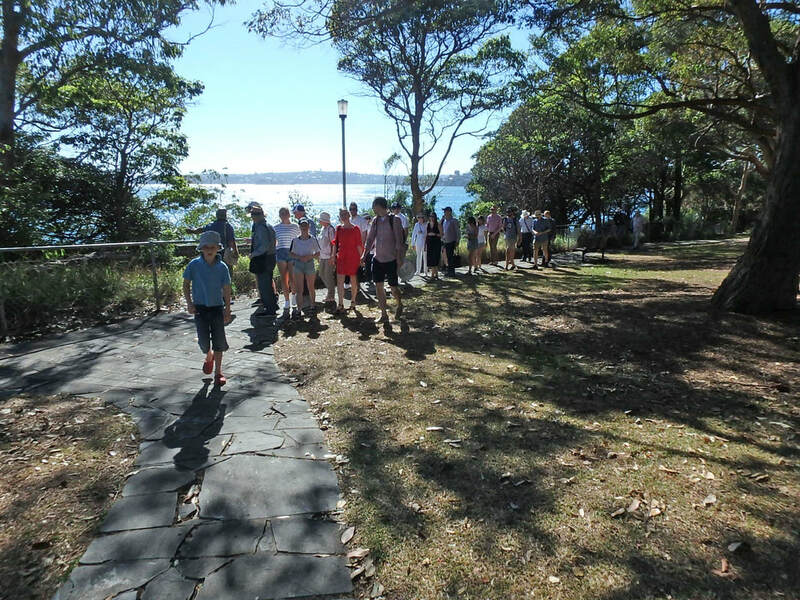 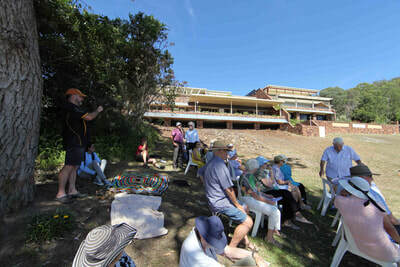 Some 40 Pat Cam family & friends took the ferry from Circular Quay around the Opera House to Garden Island where men from HMS Sirius grew onions and corn for the nascent settlement in 1788. 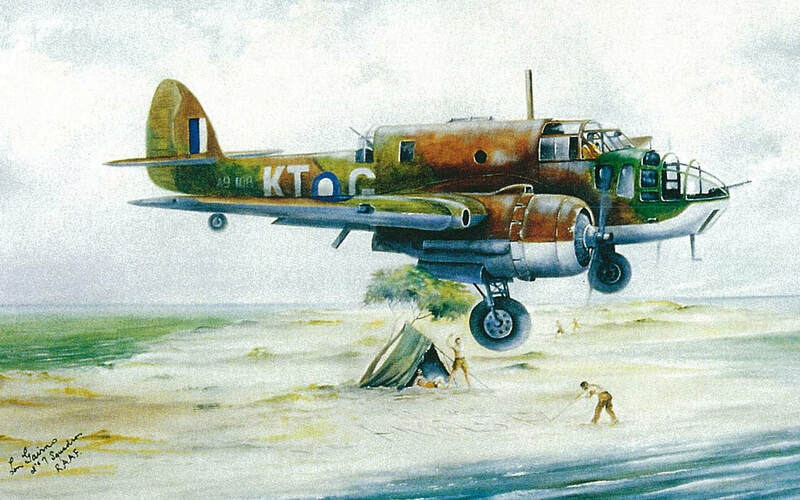 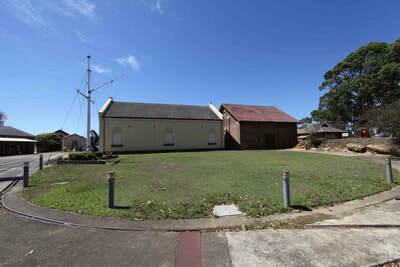 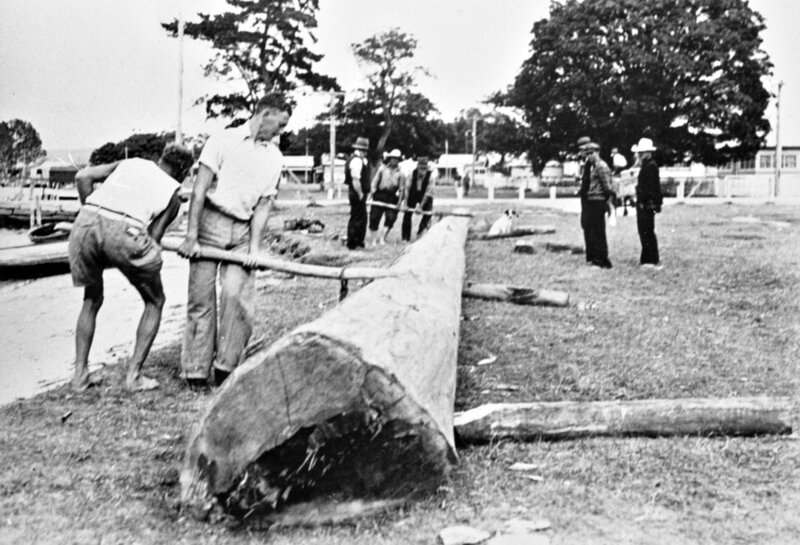 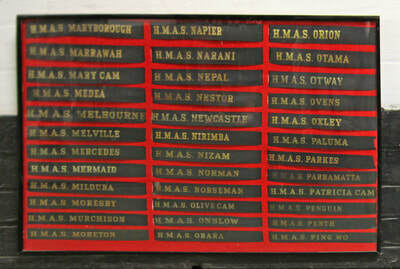 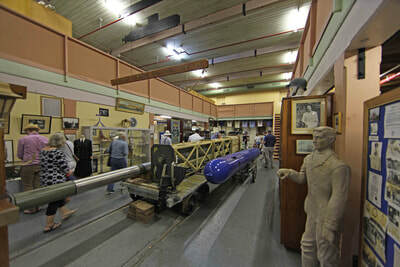 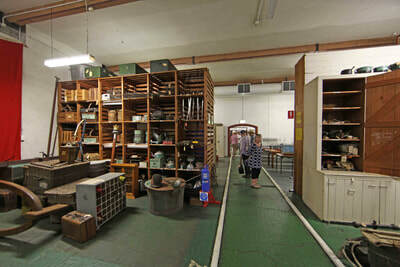 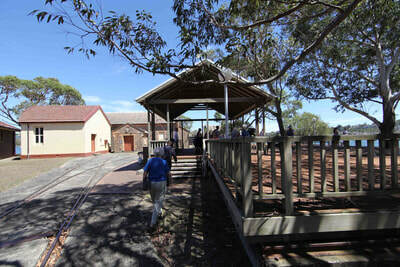 It became the base for the Royal Navy Australia Station in 1856 with the auxiliary squadron added in 1891. 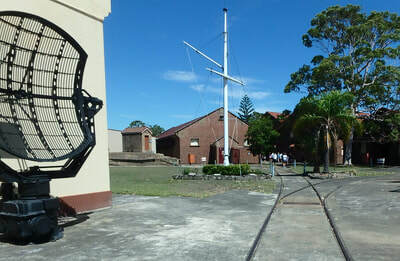 It was greatly expanded in 1945 with the addition of the vast Captain Cook Graving Dock and in 1951 a giant Hammerhead Crane which was dismantled in 2014. 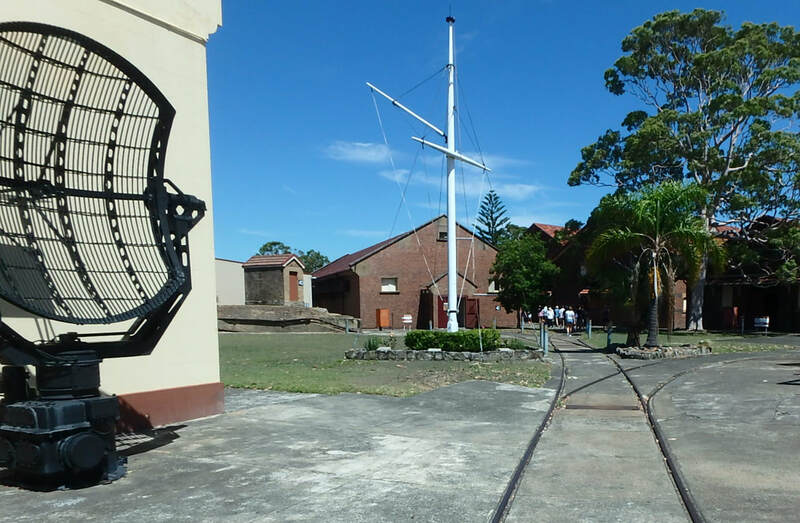 The dockyard continues to be fully operational whilst the historic area is open to public visits with a magnificent museum and glorious period buildings. 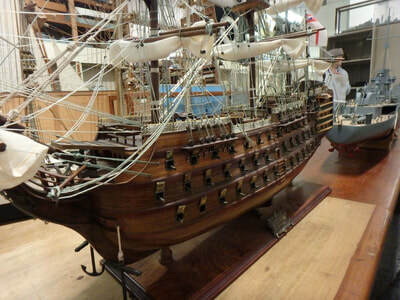 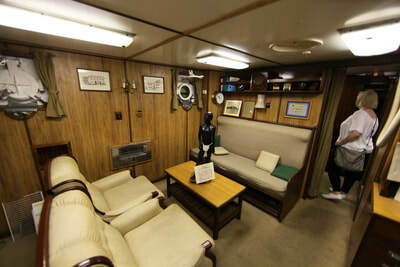 It is a centre for research and preservation of the nation's naval heritage and well worth a visit with free entry to the Heritage Centre and public areas. 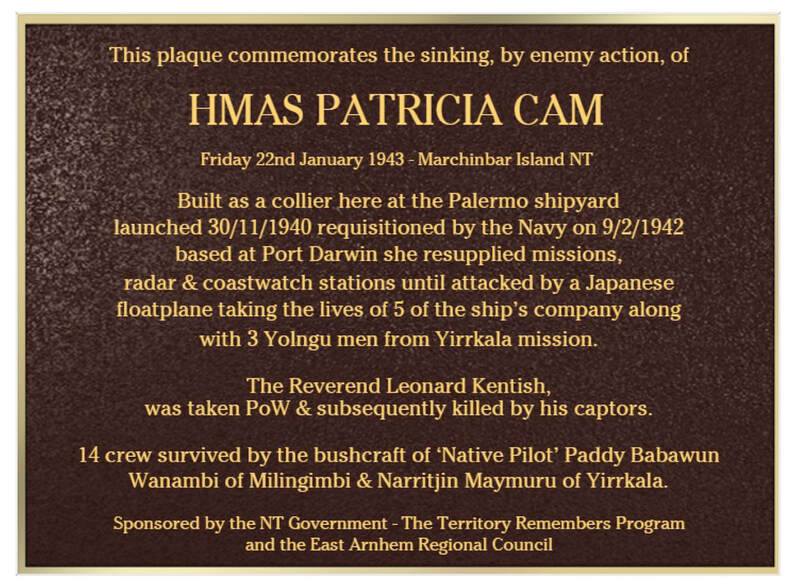 It is where the Patricia Cam was fitted with armaments before heading north. 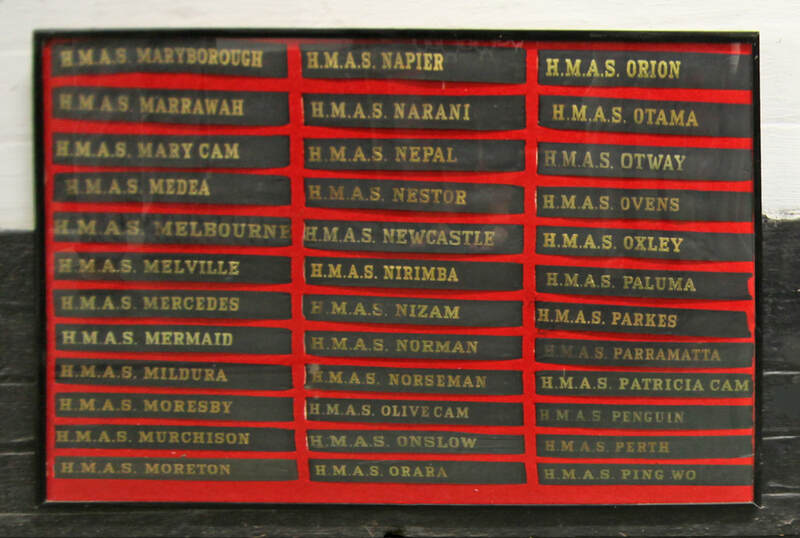 The services in the Garden Island Chapel during which individual plaques are dedicated. 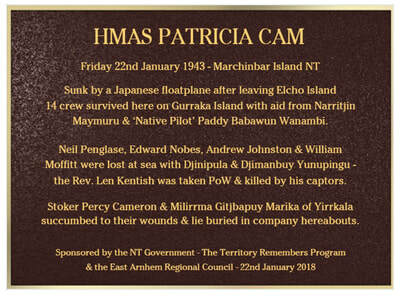 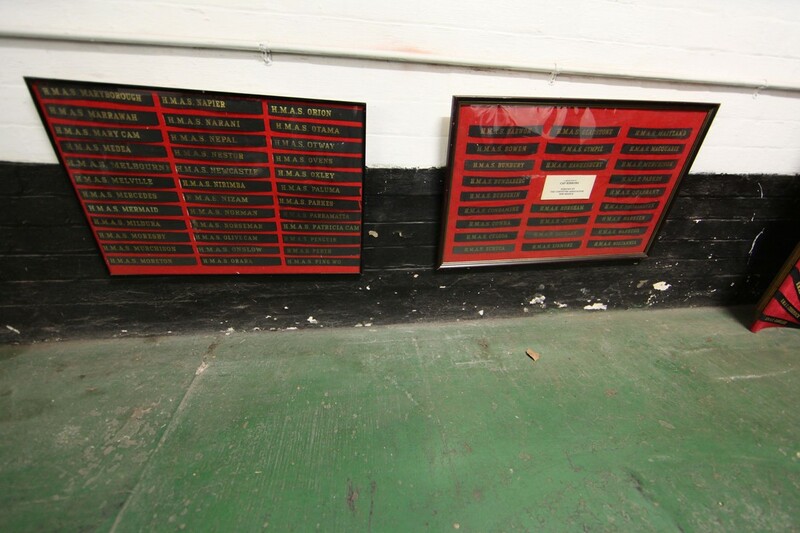 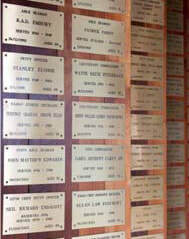 Families of service personnel who wish to dedicate a plaque can select either service. 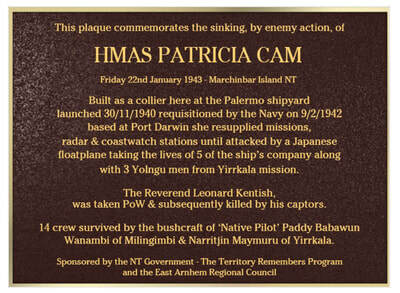 Attached below is the plaque order form and information on entry arrangements to Garden Island for these services. 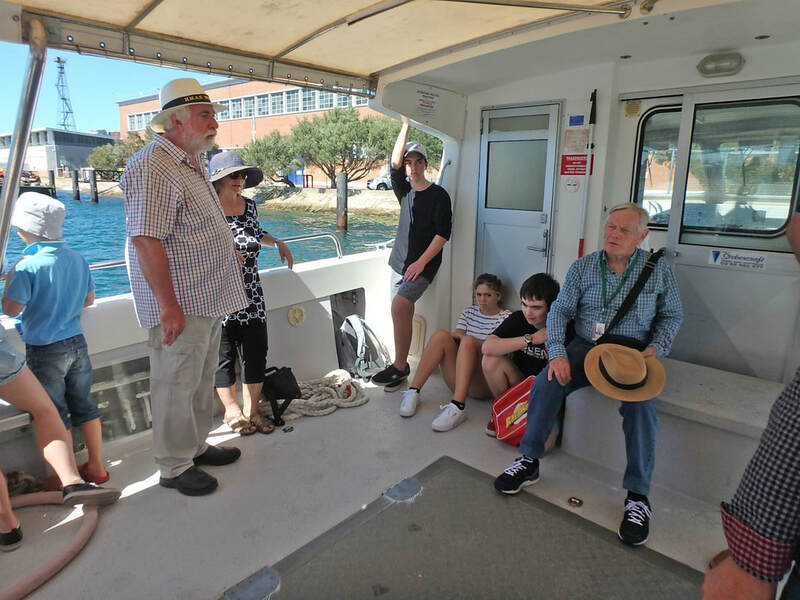 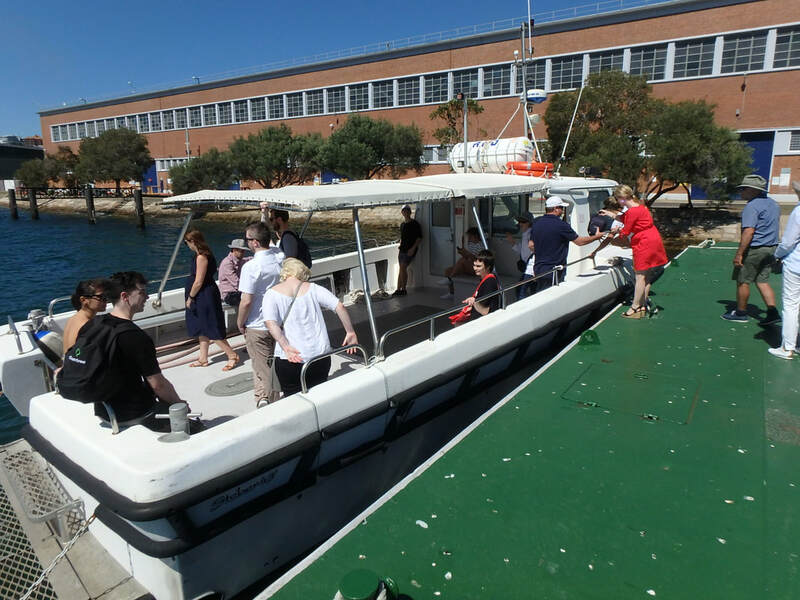 We were privileged to be taken aboard a RAN vessel for the trip under the Harbour Bridge and up the Parramatta River to Spectacle Island which is not open to the public but which houses the RAN Historical Society's collections. 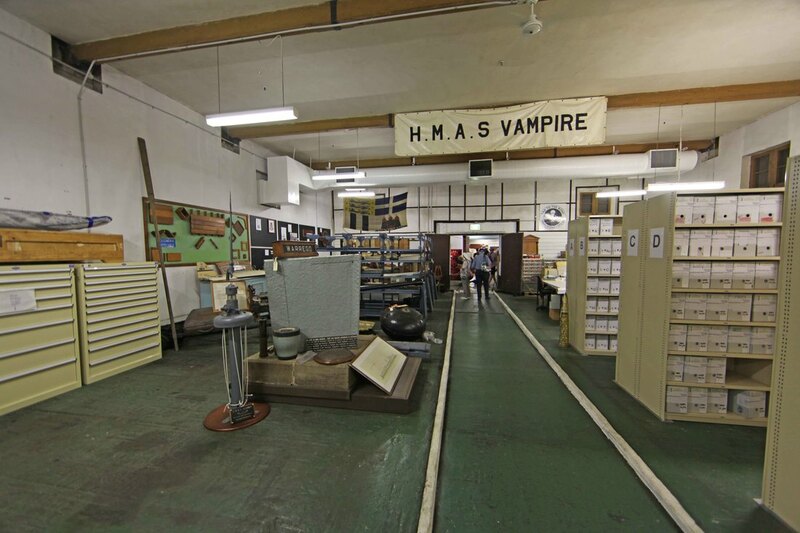 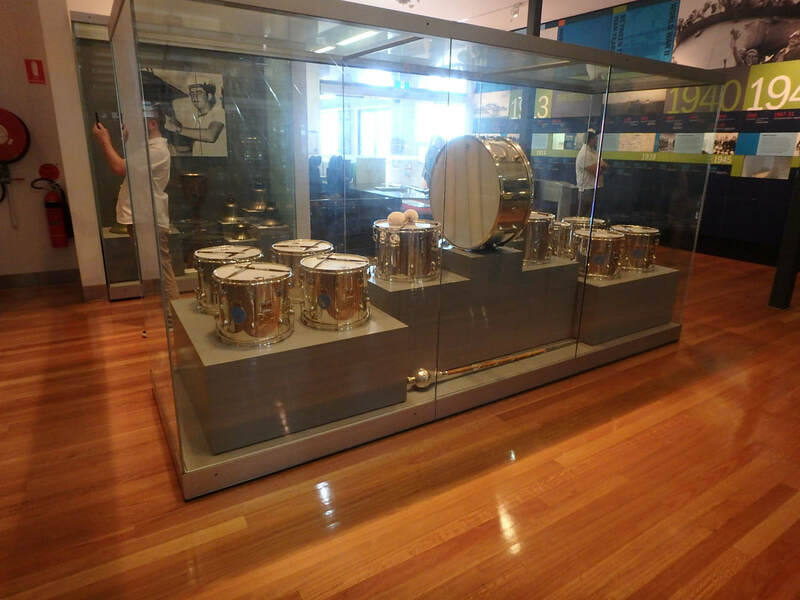 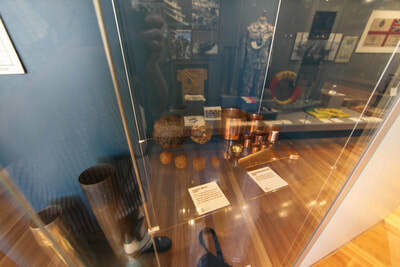 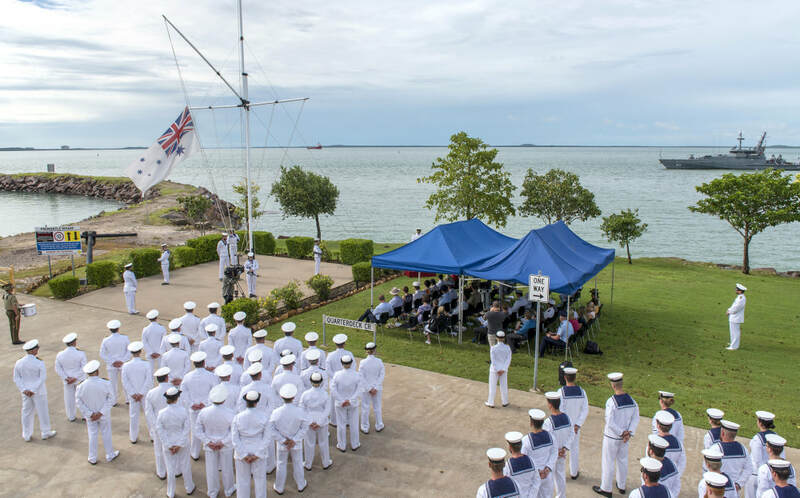 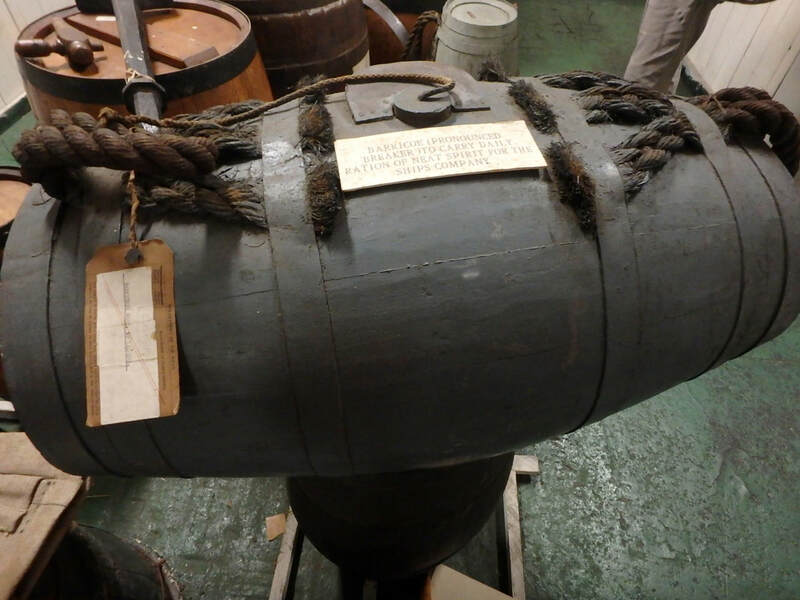 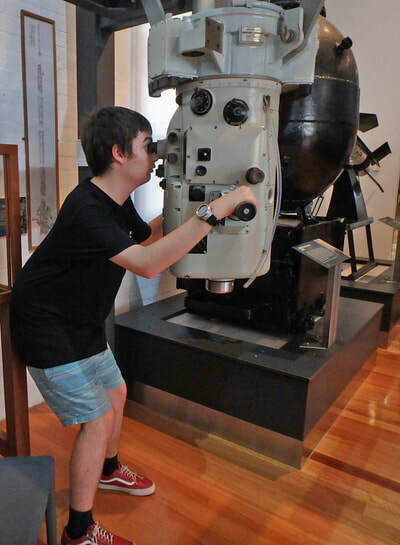 It is the oldest continuously operating naval facility in Australia having opened in 1884 as the armament depot for the Royal Navy’s Australia Squadron. 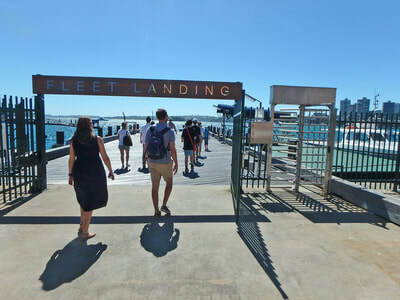 Spectacle Island was transferred to the Commonwealth of Australia following Federation in 1901 and continued as the armament depot when the Commonwealth Naval Forces became the Royal Australian Navy in 1911. 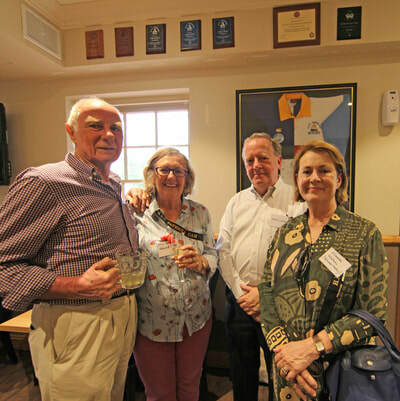 Sydney Cricket Ground - One Day International Australia Vs England 21st January 2018 from atop the Noble Stand.